Before I begin with the recipe, I do admit to the Russian name of the soup not having a “t” at the end. 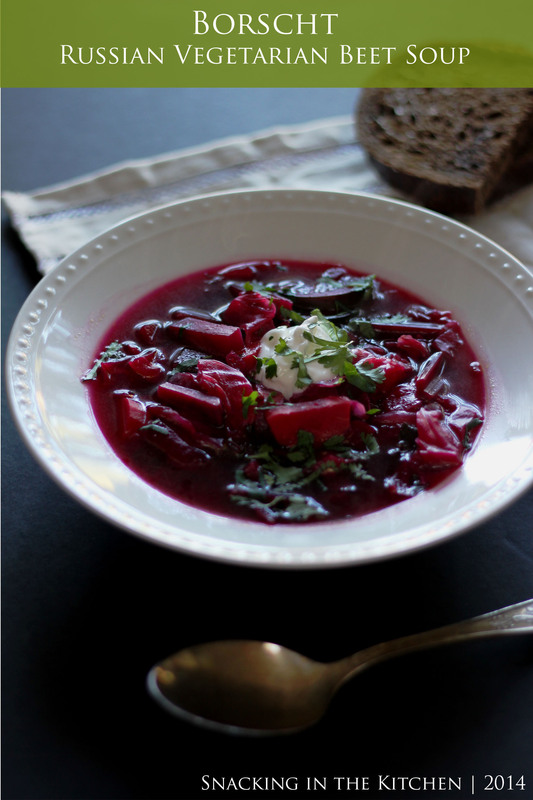 But this is in English, so we will stick with Borscht. Now, I have grown up eating this hearty, ruby red soup prepared lovingly by my Dad. In fact, I just ate a bowl at my parents’ house tonight, and it was as usual, the best. 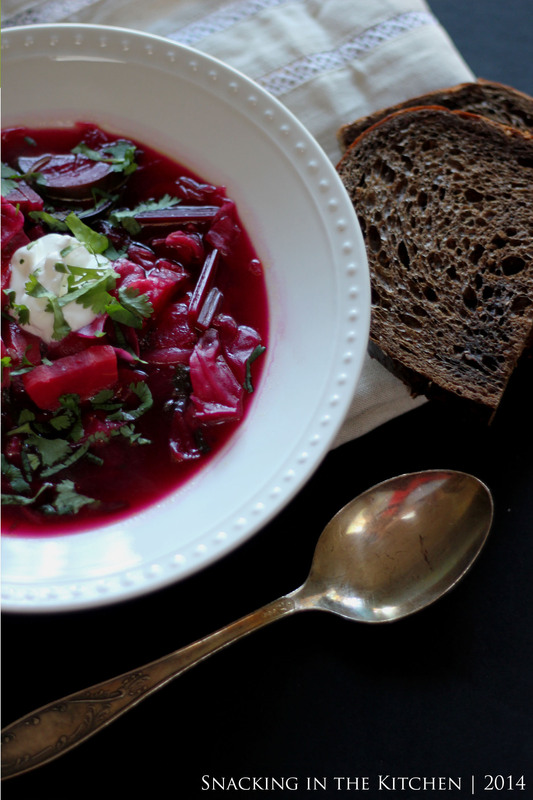 But sometimes, I want to make borscht at home, and this is my quick, one-pot version of my dad’s recipe. 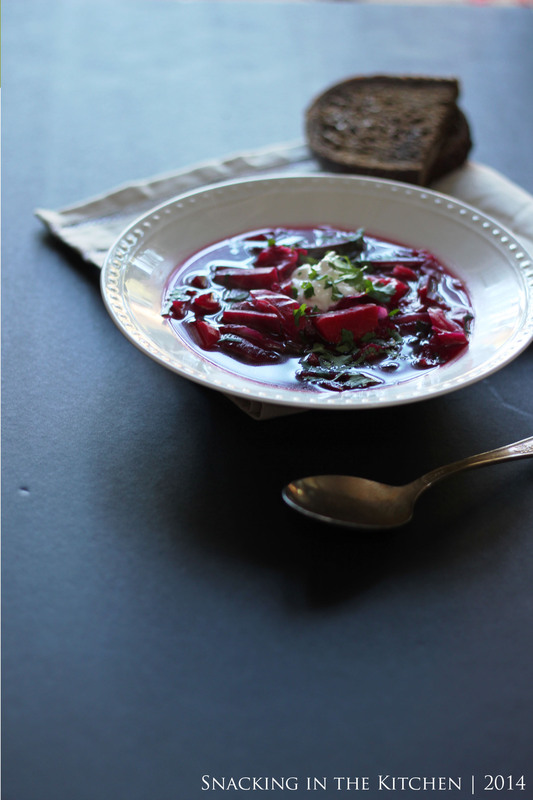 The are numerous of recipes for borscht out there, with each family using their own particular technique and a set of ingredients. 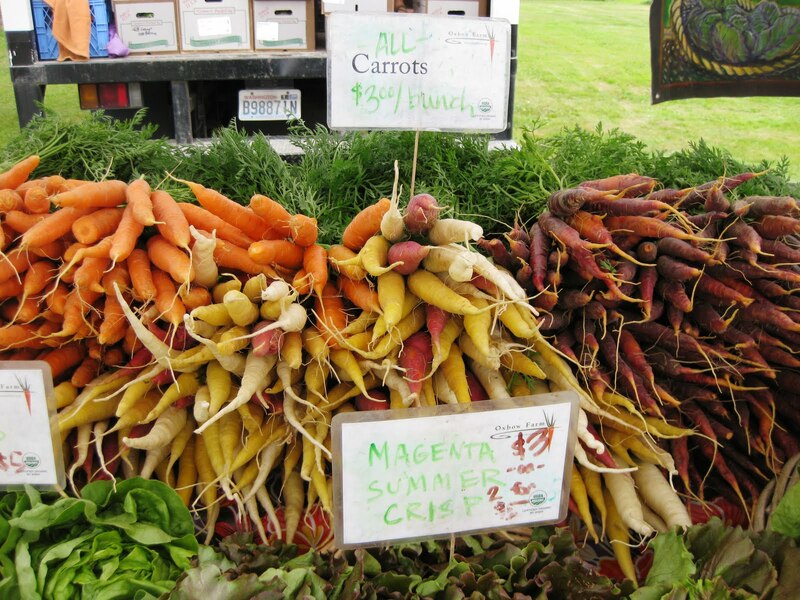 But for the most part, there are a few must-have ingredients: beets, cabbage, and carrots. The rest? It’s up to you! I was out of potatoes, but normally would put those in as well. 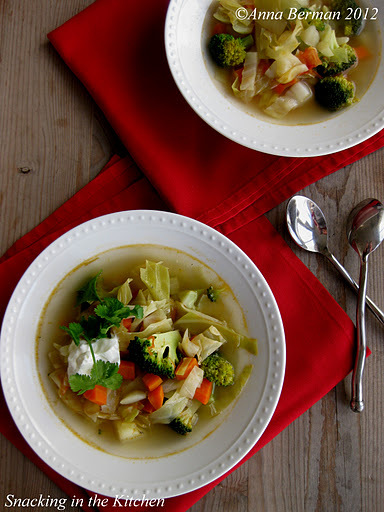 Celery, celery root, and even zucchini are great additions to the soup. 1. Heat oil in a large soup pot over medium high heat. Add onion and cook for 10 minutes. 2. Add beets to the onion and cook for another ten minutes. 3. Add garlic and carrots and cook for another five minutes. At this point, you can also add a few tablespoons of tomato paste. 4. Pour in water (or stock), making sure the vegetables are covered by a few inches. Bring to a boil. If you were using potatoes, you’d add them now, and cook half way through. 5. Lower the heat to medium and stir in cabbage. Cook just until the cabbage is wilted. 6. Season with salt, pepper, lemon juice and sugar. Soup is ready! Add a dollop of sour cream and freshly chopped herbs (dill, parsley, even cilantro). I often serve it with fresh grated garlic for an extra kick and a dash of hot sauce. Time for soup again. 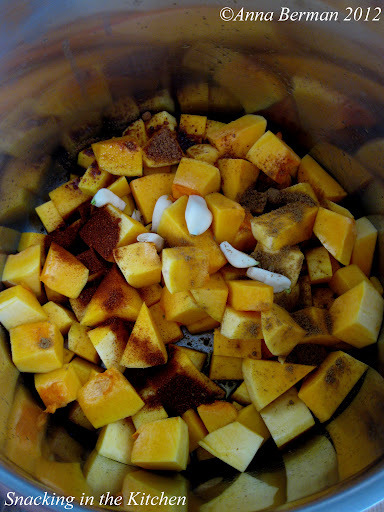 Butternut squash has been a regular on the soup rotation, and this time, I cook it together in coconut oil with onion, celery, carrot and a spiced mix of curry, cayenne and cumin. 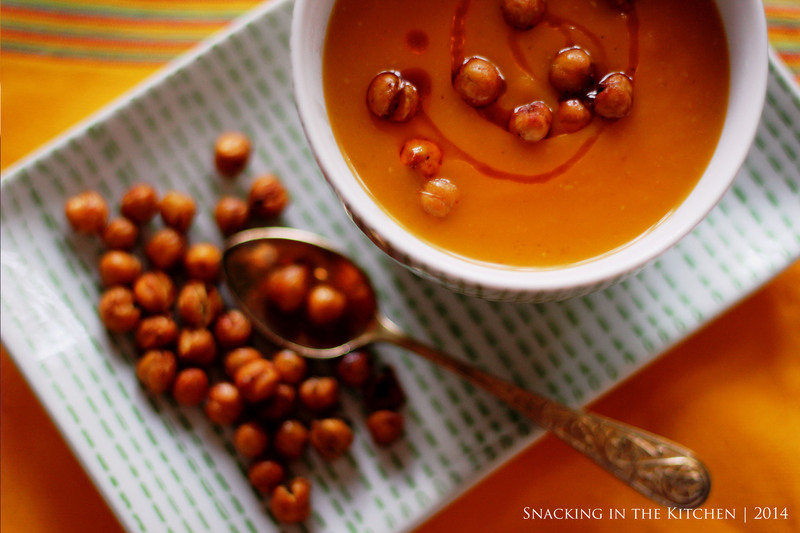 This smooth, earthy, slightly spiced soup was the background for the Curried Roasted Chickpeas I shared with you earlier this week. 1. Melt coconut oil in a large soup pot over medium high heat. 2. 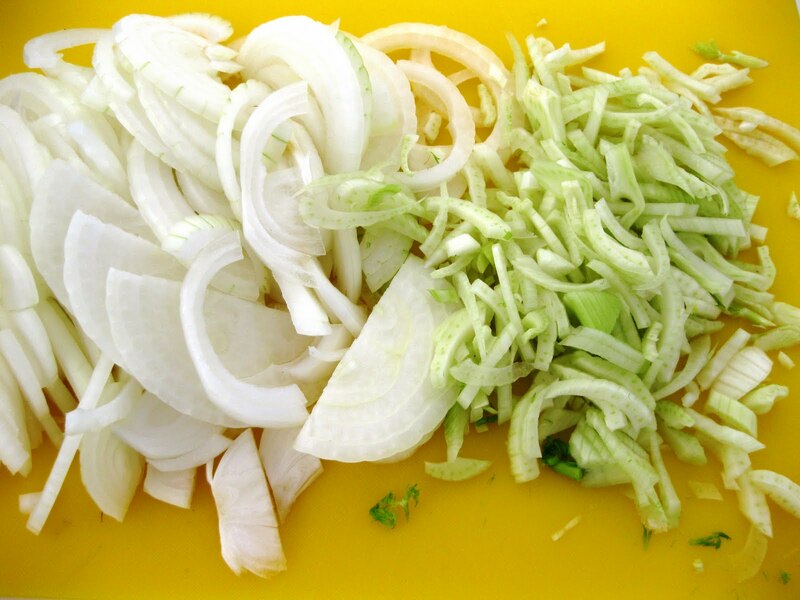 Add onion and spices and cook until onion begins to soften and spices release their fragrance, 5-7 minutes. 3. 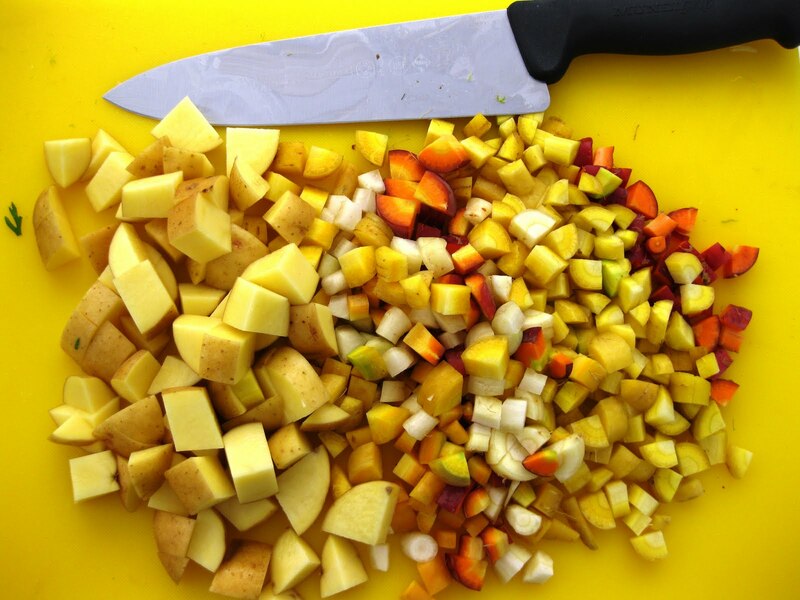 Add squash, carrot and celery; cook another 5 minutes. 4. Cover with chicken broth and bring to a boil. 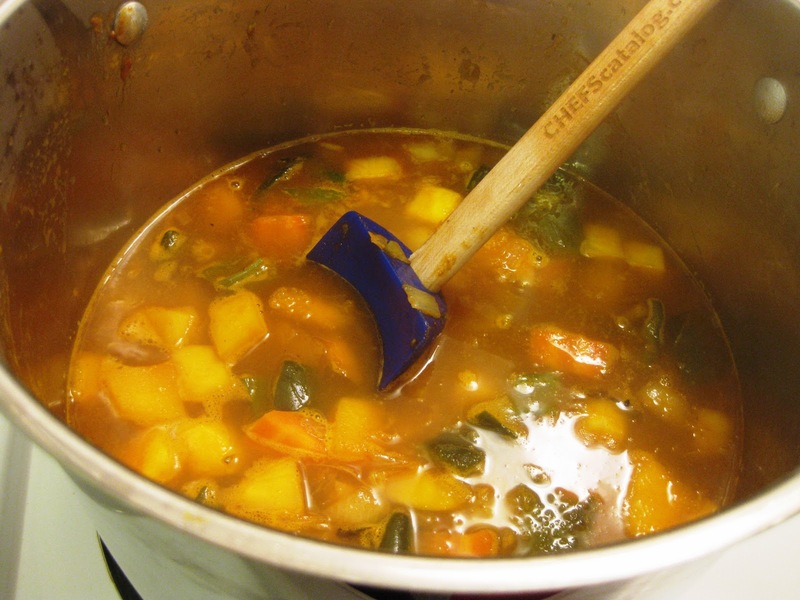 Lower the heat to medium-low and simmer the soup until the vegetables are soft, 30-45 minutes. 5. 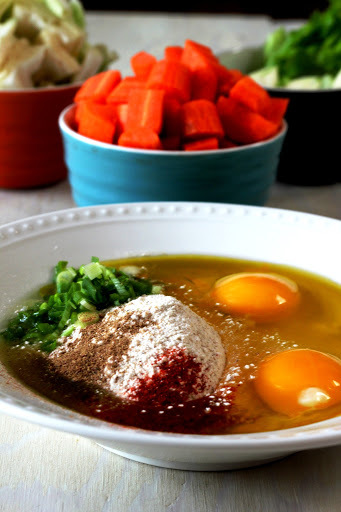 Puree the soup until smooth and season with salt and ground black pepper to taste. 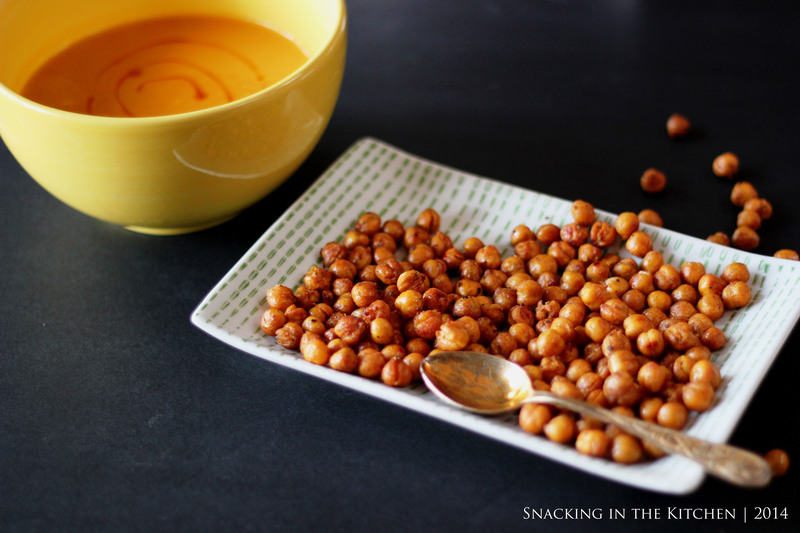 And don’t forget to make a batch of Curried Roasted Chickpeas to go along with the soup. Some foods just go together. Mashed potatoes and meatloaf. Burgers and fries. Pizza and beer. Last night, while I was having a quiet evening at home, I was craving one of these classic dinner combinations. For me, it was a bowl of roasted tomato soup and a grilled cheese sandwich. For full disclosure, I admit that the soup came straight from a container. But worry not, I am giving you 5 ways to spruce up your tomato soup and 5 more ways to upgrade your grilled cheese sandwich! Add minced onion and garlic. You can add the two raw, or quickly saute them in some olive oil. Add chopped herbs. Basil is classic with tomatoes, but parsley and cilantro work equally as well. Also, try chives, thyme, or green scallions. 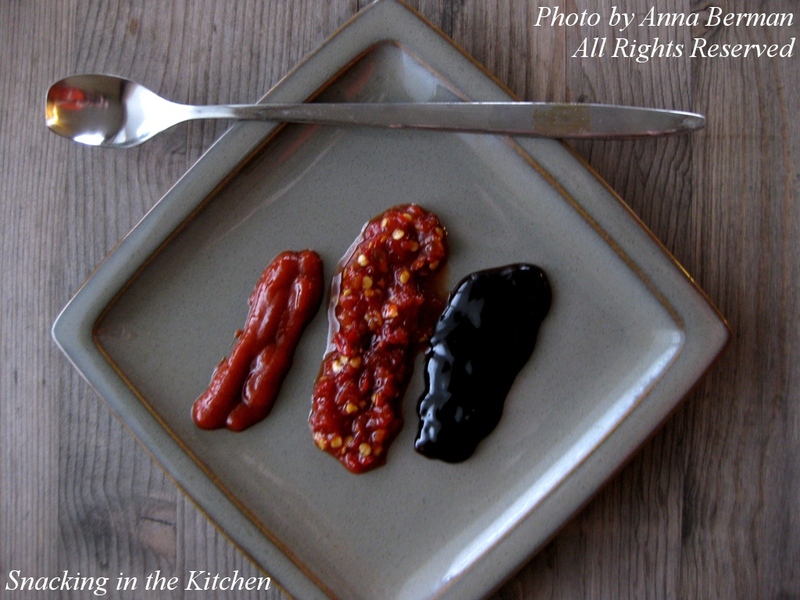 Drizzle with a tablespoon of extra virgin olive oil -or- balsamic glaze reduction – or – heavy cream. Serve with cheese croutons. Think of this as the tomato soup and grilled cheese in one. It’s purely delicious and you don’t have an extra plate to wash from holding the grilled cheese sandwich. Put an egg on it. No joke. A properly poached egg on top of the tomato soup is quite decadent and beautiful. Switch up the bread. Try focaccia, bagel, or croissant. Use a combination of shredded and sliced cheese inside. Try a slice of smoked Gouda with shredded Swiss cheese. Fit thinly sliced onion and tomato between the bread and the cheese. Spicy salami is another fantastic addition. Triple decker. If you can’t get enough of the sandwich, build it with an extra slice of bread – and for an extra bonus, you’ll get to use more cheese. Cheesy! 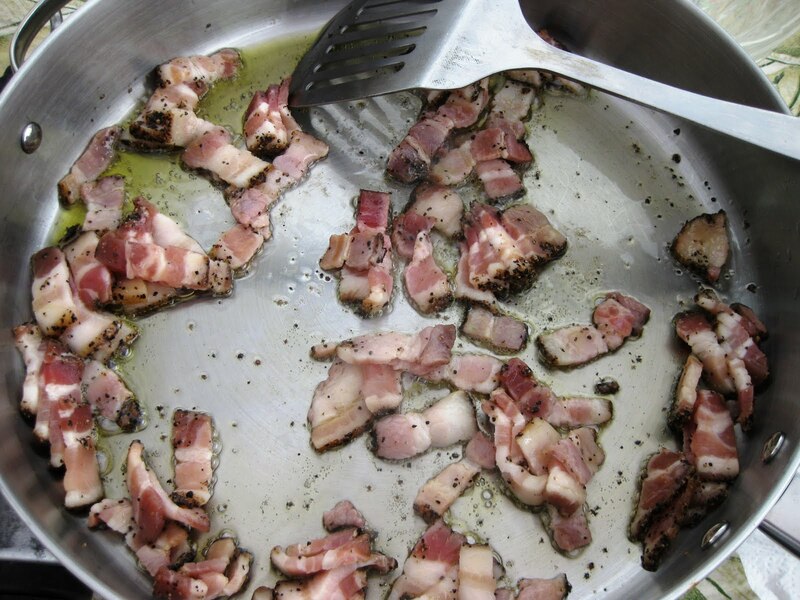 Wrap the sandwich in bacon or prosciutto before frying. This is kind of a joke, but I’m sure there will be at least a few of you who will try this. What is your favorite dinner combination? 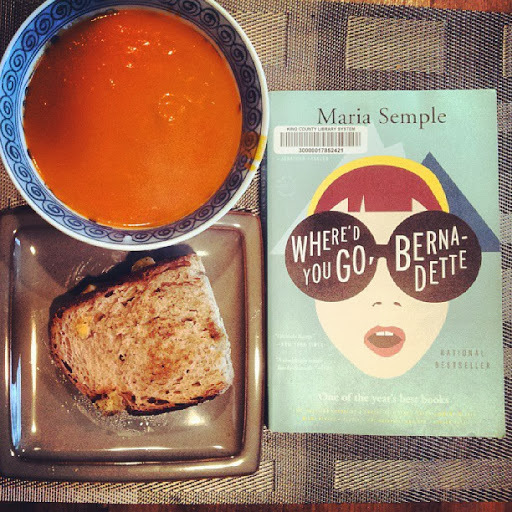 What is your favorite way to eat tomato soup and grilled cheese sandwich? I’m happy to share my latest pho spot in Seattle and it is conveniently located to Allrecipes.com and just a few minutes away from Pike Place Market. Long Provincial Vietnamese Restaurant has a decor of an upscale place with prices of a hole-in-the-wall walk-up with fast and fuss-free service and bowls of steaming-hot pho. The menu is lengthy with rice dishes, rice stir-frys and the house specials. For now, I have been happily dining on pho with rare steak and spring rolls. Come Spring, I might switch to a cooler side and order a noodle bowl with lemongrass grilled pork and pickled daikon with carrots. If you are in the area, be sure to stop by and discover the dishes of Long Provincial for yourself. 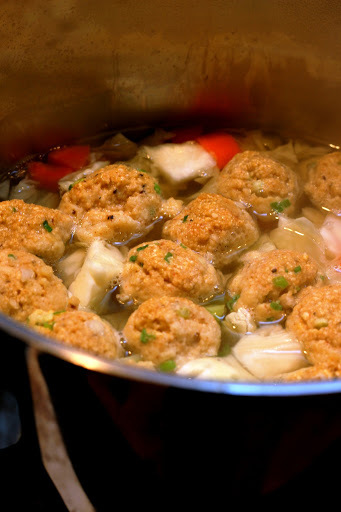 I wonder how many families sat down to a bowl of Matzo Ball Soup this Monday as they celebrated the first night of Passover. You could count my family as one. The Artist and I celebrated at home with my parents. 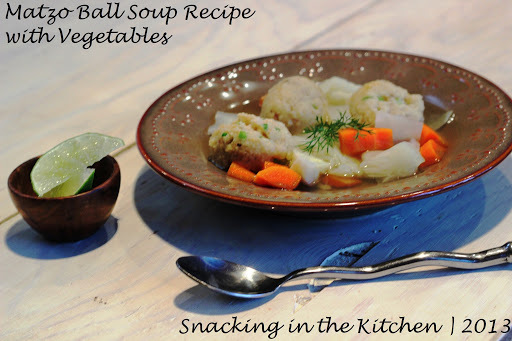 This Matzo Ball Soup however was prepared a few weeks earlier, as I was battling a cold and allergy attack. 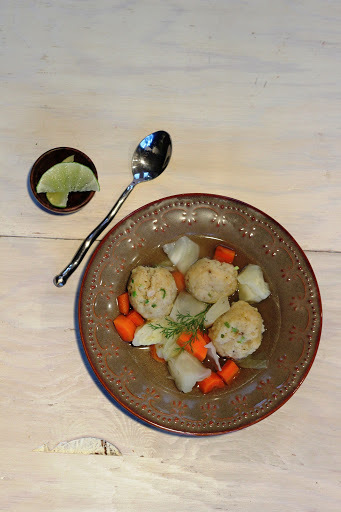 I did feel better as I bit into light, airy balls of matzo and herbs and sipped on a delicate chicken broth with vegetables. 1. 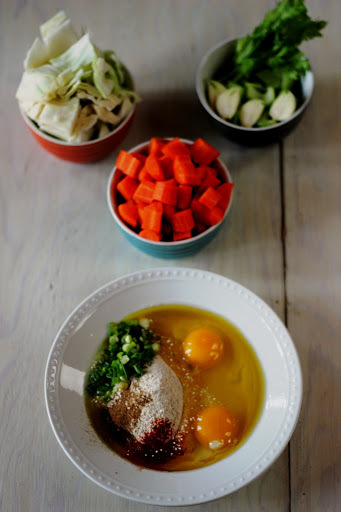 Prepare the matzo ball mix according to the directions, using 2 eggs, olive oil, and adding the scallions, spices, salt and pepper. 3. 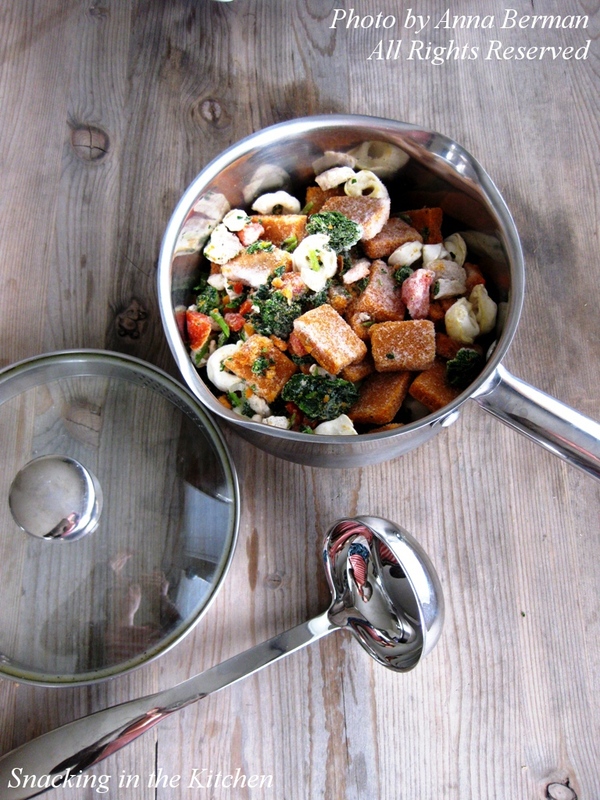 Place the vegetables in a large soup pot. Add chicken broth and enough water to cover the vegetables completely. Bring the liquid to a boil over medium high heat. 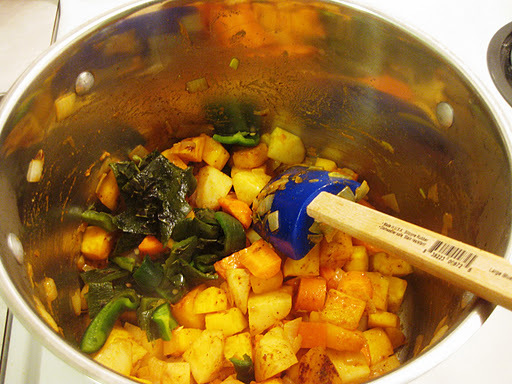 Reduce the heat to medium and cook the vegetables for 15 minutes. 4. 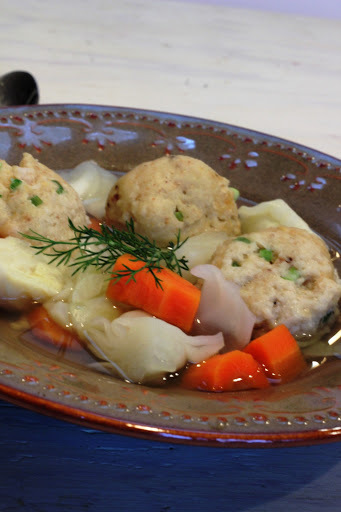 Gently lower the matzo balls into the soup and cook for 15 minutes. The soup is ready! I added a healthy squeeze of lime juice and a sprig of dill. Taste the soup and adjust as needed. The secret is out! 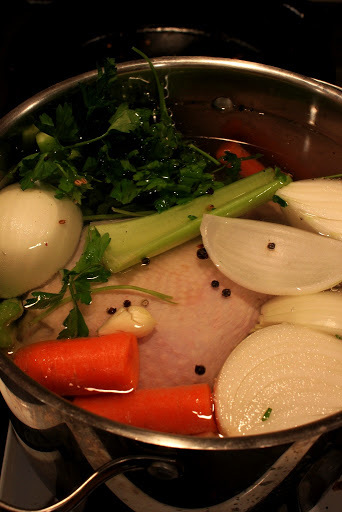 You can make chicken stock in your own kitchen. 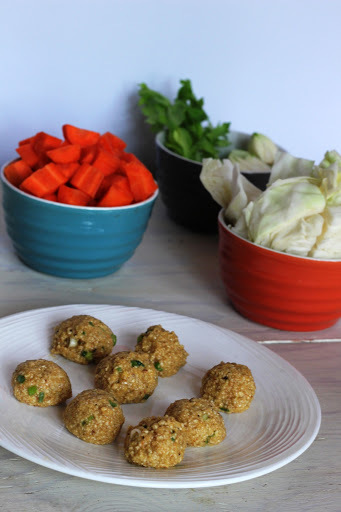 So unless you are in a hurry, leave the packaged stock at the supermarket and instead, pick up a chicken, a few carrots, onion, celery and parsley. That’s pretty much all that you need to make a flavorful, base chicken stock. If you can spare a few extra dollars, purchase an organic chicken, you really would be able to taste the difference. Choose a chicken that weighs about 4 pounds. Place the chicken in a large soup pot. Add 1 large onion, quartered; 3 large carrots, halved; 2 celery stalks, halved; bunch of parsley stems; 4 garlic cloves, crushed and 6-10 whole black pepper corns. Cover the ingredients with cold water and bring to a boil over medium-high heat. Next, turn the heat to medium low and simmer the stock for 2-3 hours, skimming occasionally. It’s best to let the stock cool and refrigerate over night. The next day, remove the fat from the top and strain the broth, if desired. I personally use the chicken and the vegetables to make soup. 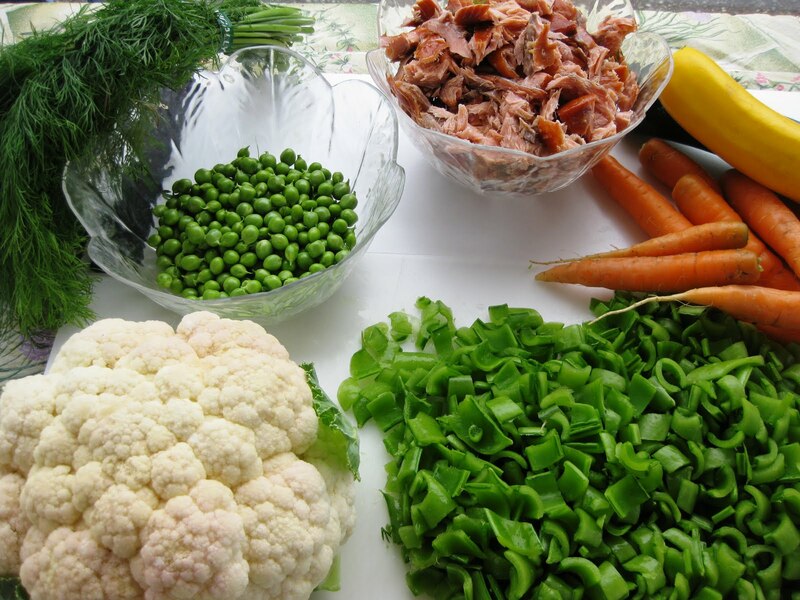 Remove the chicken skin and bones and shred or dice the meat and cut up the vegetables. What’s next is up to you! 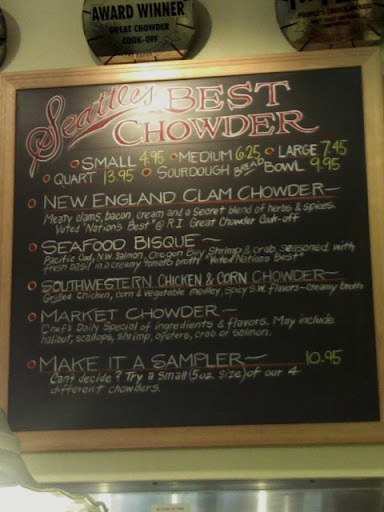 Pike Place Chowder in Seattle – What’s for Lunch? The other day, lunch plans fell through, and I was left sitting at my desk without food. Hungry. Sneezing and coughing. I was cold. I just had pho a few days earlier and was craving a different kind of soup. Why not chowder? 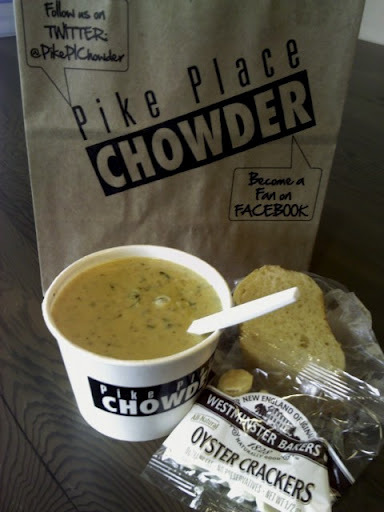 I have heard about Pike Place Chowder many times with rave reviews – fresh, creamy, delicious and comforting. I chose to skip the busy, original Pike Place location, and instead headed a few blocks up to the Pacific Place. 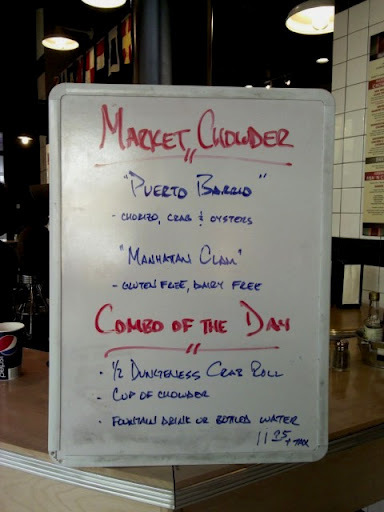 Before I saw the regular menu, I was greeted by a hand-written menu with two daily specials. Chorizo and oysters? How could I resist. I went for a medium size, sans the bread bowl, and received a complimentary slice of bread and crackers. 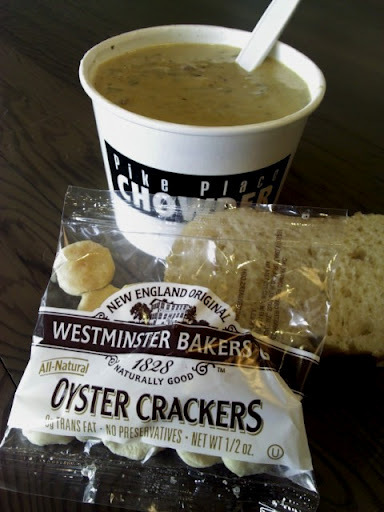 The chowder kept warm on my way back to work. I added a sprinkle of black pepper and a few shots of Tabasco and lingered on the creamy, rich, health restorative chowder. What’s your favorite lunch spot in Downtown Seattle? 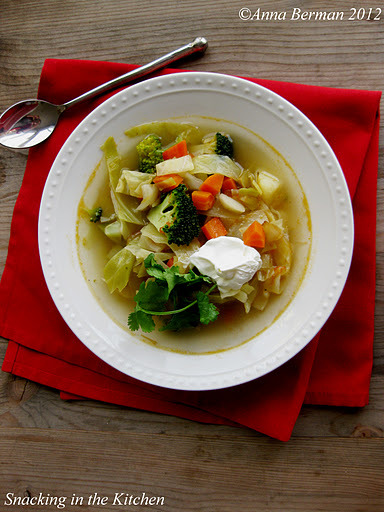 If bosrcht had a cousin, this cabbage soup would be it. The soup basically has all the elements of bosrcht minus the beets, so think of it as a paler, more innocent cousin. Or perhaps it just doesn’t blush as much. The soup was a regular staple of my childhood. 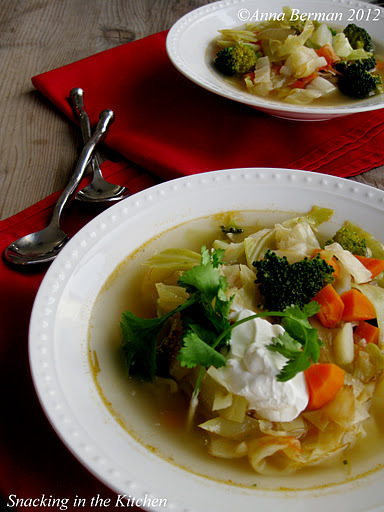 The simplicity of potatoes, cabbage, and carrots combined together in a delicate melody. 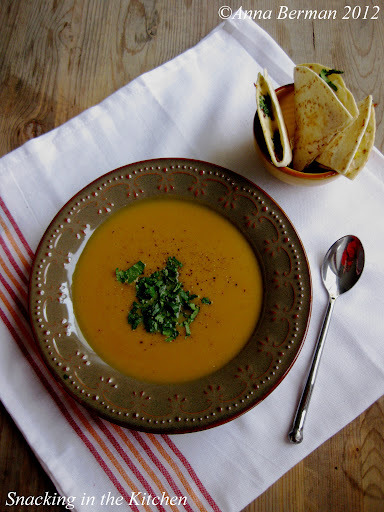 The soup was garnished with a dollop of sour cream and freshly chopped parsley or dill. 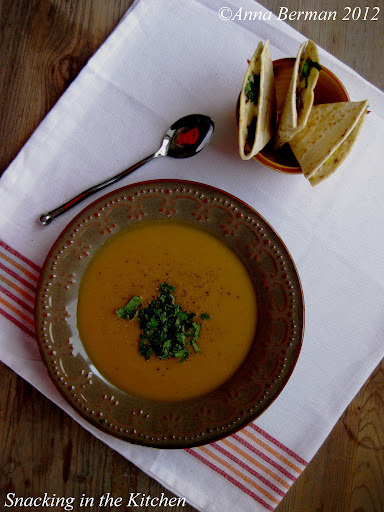 This time, when making the soup, I decided to give it a bit of a punch with the addition of jalapeno pepper, fresh lime juice and chopped cilantro. Last minute, I added broccoli florets for color and extra nutrients. If you are not concerned with making this a vegetarian recipe, feel free to use homemade chicken broth. 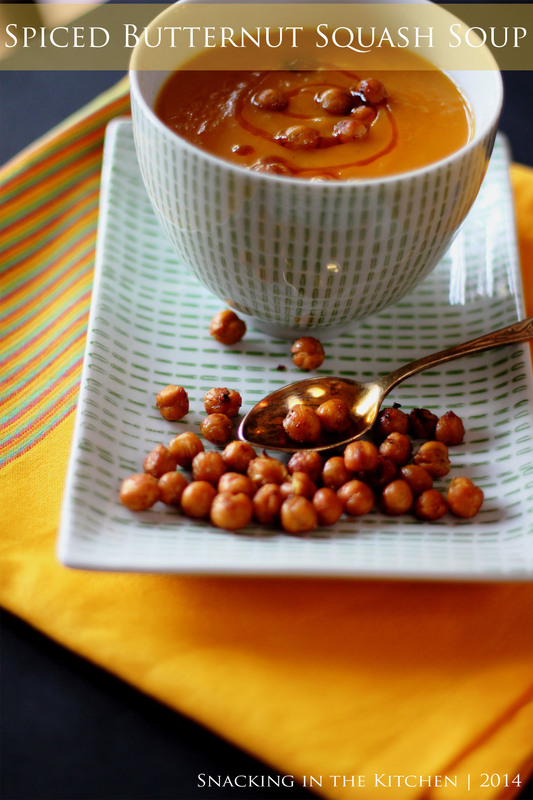 This is a lovely bowl of goodness to keep you warm on a cold day. Enjoy! 1. Heat oil in a cast iron skillet over medium high heat. 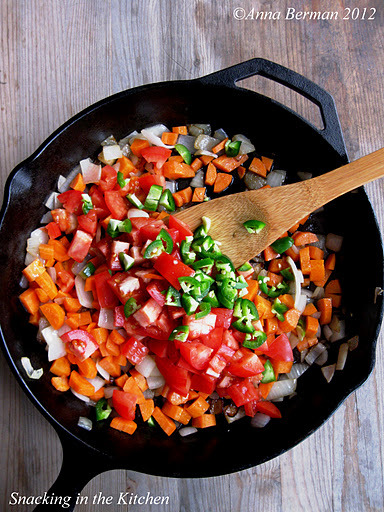 Add onion, carrots, tomatoes, and jalapeno. Cook for 10-15 minutes, stirring occasionally. 2. 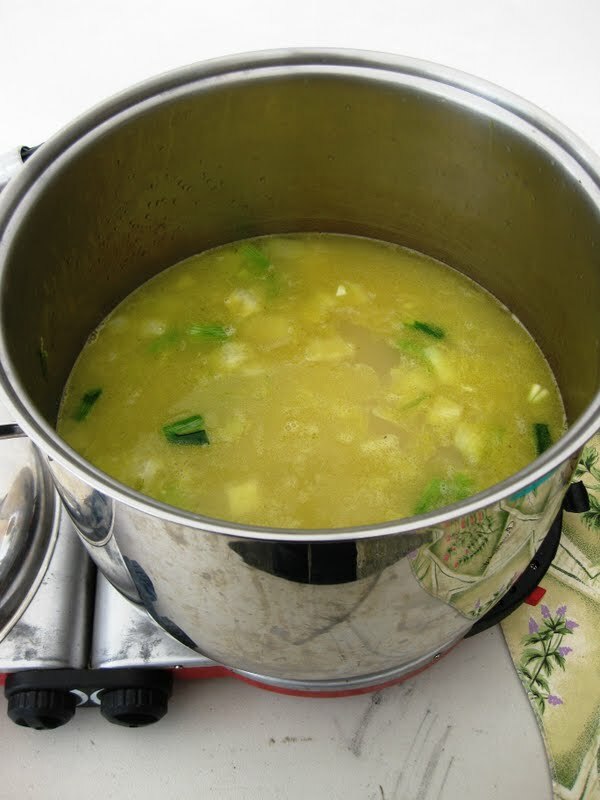 While the vegetables are cooking, add potatoes to a soup pot and cover with water. 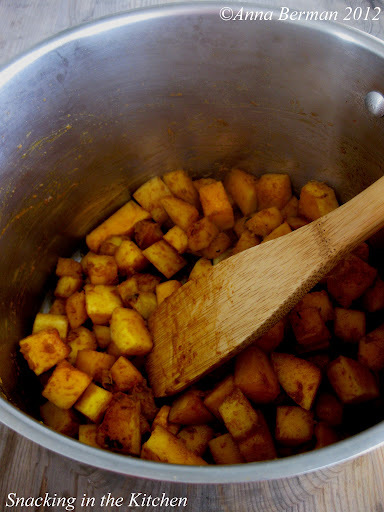 Bring to a boil, lower heat and simmer until the potatoes are almost tender, about 15 minutes. 3. 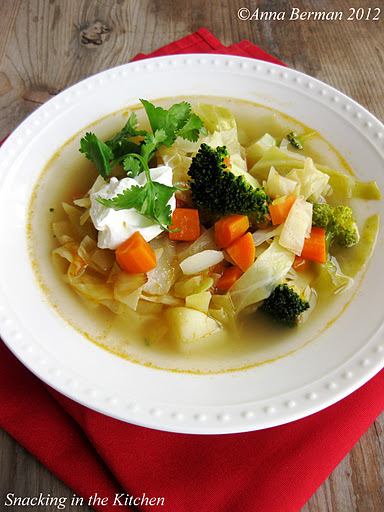 Add the sauteed vegetables and cabbage to the soup. Bring back to a boil and cook for a few minutes, just enough to wilt the cabbage. 4. Stir in the broccoli florets. Season the soup with lime juice, salt and pepper. 5. 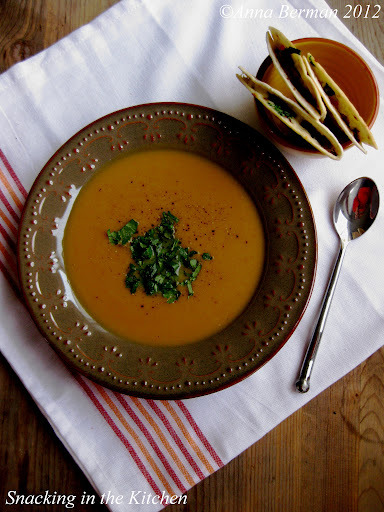 Serve the soup with sour cream and chopped cilantro. Do you like my new soup plates? Another great Value Village find. If you read my blog, you know how much I love soup. Hot or chilled, brothy, pureed, or chunky, I love it all. On most occasions I make my own soup. On some occasions I go out for pho, and on special occasions I go to my parents’ for a bowl of dad’s borcht. 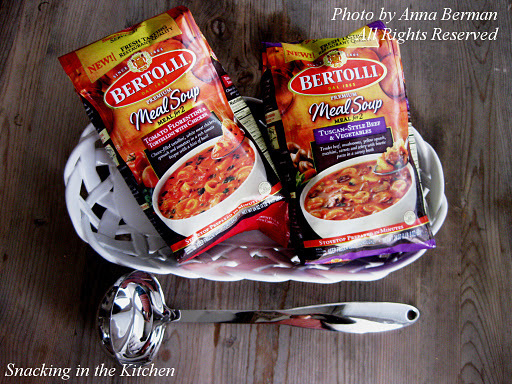 I hardly ever buy prepared soup, but was ready to give it a try when the Bertolli people contacted me and asked my review of their new line of Premium Meal Soups for 2. 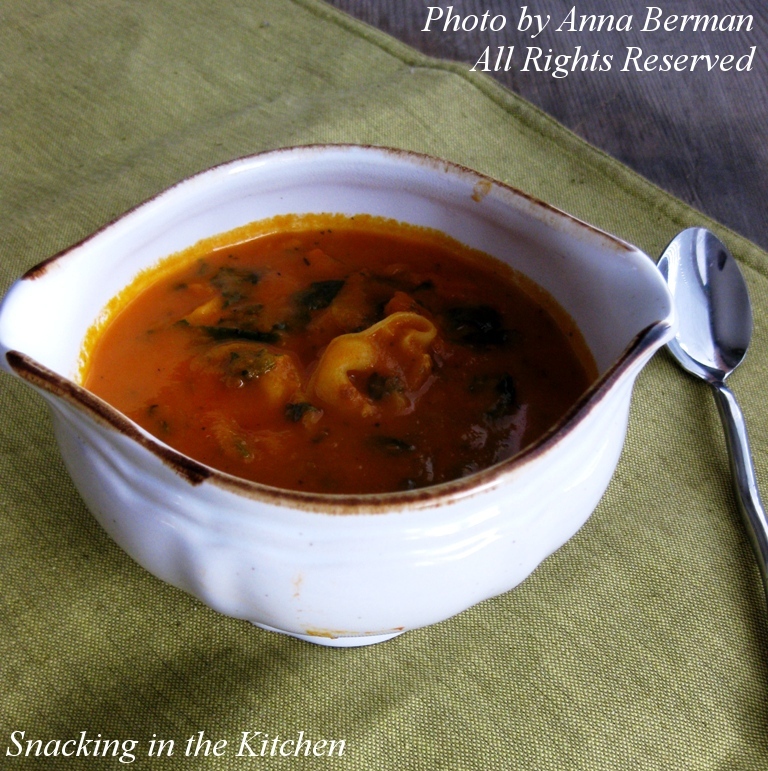 I stopped by the frozen section at my local grocery store and picked up Tomato Florentine and Tortellini with Chicken Soup. Scroll down to see what happens next and to enter a giveaway for a chance to try the soup for free! I also picked up Tuscan-Style Beef & Vegetables Soup that I hope to try soon! Here’s what the ingredients looked like directly out of the frozen bag. To prepare the soup, I simply emptied the contents of the bag into a pot and added a cup of water. Once the soup came to a rapid boil, I lowered the heat, covered the pot with a lid and simmered for 5 minutes, stirring occasionally. The soup smelled fantastic. To be perfectly honest, I would have been happy just with the tomato base – it was cheesy and sweet, creamy and delicious. I would love to substitute the tortellini and chicken with a sourdough grilled cheese sandwich, but alas, this was not part of the deal. Are you interested in trying the soup for yourself? Enter the giveaway sponsored by Bertolli! 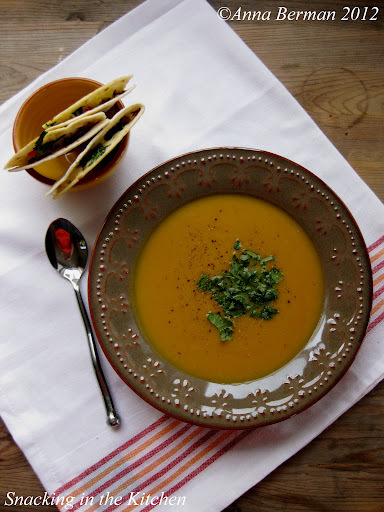 To enter, please leave a comment on this blog mentioning your favorite soup! Be sure to include your email address so I can contact you in case you win. How I wish I could remember the first time I had pho. But I can’t. It must’ve been years ago, most likely on a cold rainy day. I must’ve fallen in love with pho instantly. Maybe it was the do-it-yourself approach, where you mix your own special combination of Sriracha, chili paste and hoisin along with cilantro, thai basil and lime. Maybe it was the slurping that went along with each bowl of pho. Maybe the brisket, who knows! I fell in love fast and hard. Here in Seattle, I have had pho too many times for me to count. More often, than not, I have been accompanied by my awesome pho buddy – Alla! 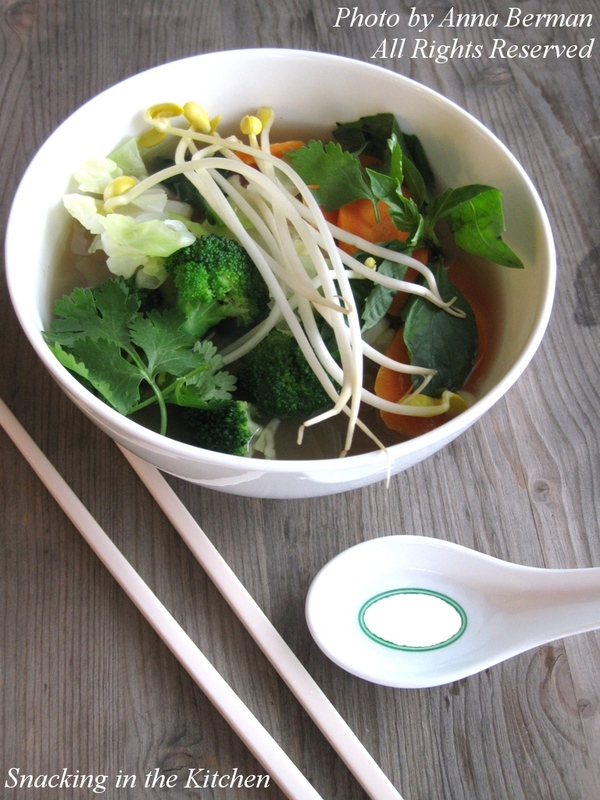 We’ve shared bowls of pho in the heat of summer and in the gloom of fall. 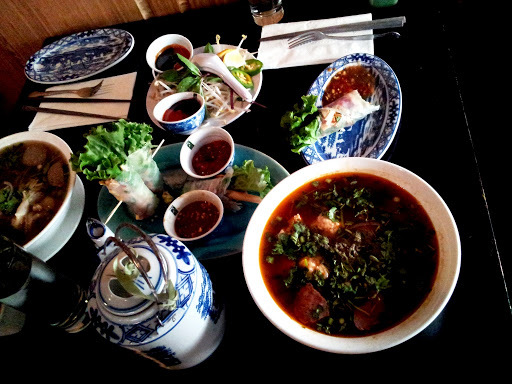 We celebrated life’s happy moments with pho, and met over pho to heal broken hearts and soothe sore throats. Last week, when I had a chance to try pho at home, there was nobody else I would’ve rather shared the experience than with her. Unfortunately, the commercial pho broth I was testing lacked in flavor, and I would rather not recommend it, but the experience of pho at home was fantastic! Next time, I will make my own broth, steeping cinnamon, cloves, star anise, ginger, and garlic for a few hours. 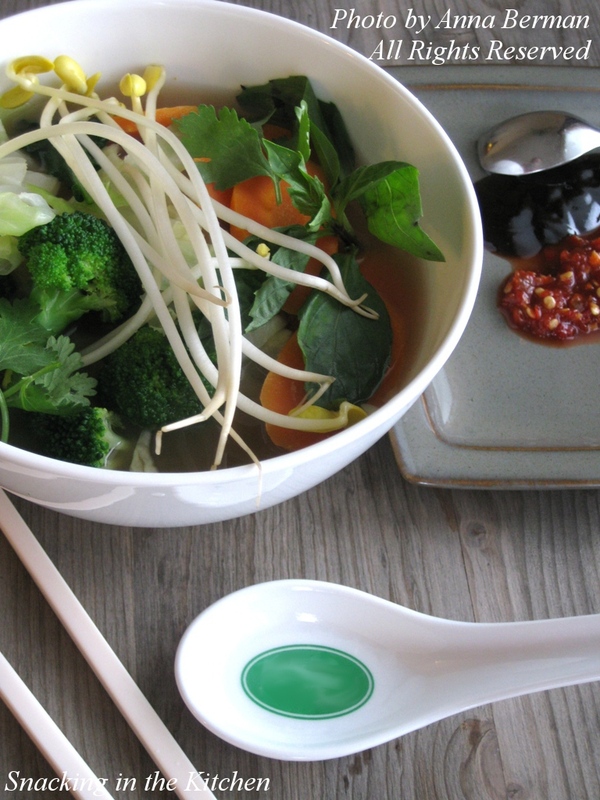 For now, I will share with you the how-to on enjoying pho at home. Alla and I always ask for extra vegetables with our pho. Sometimes we hear a welcomed “yes, absolutely!” Sometimes, our server stares at us and gives us the most definitive “no.” In my kitchen, we get to do what we want. 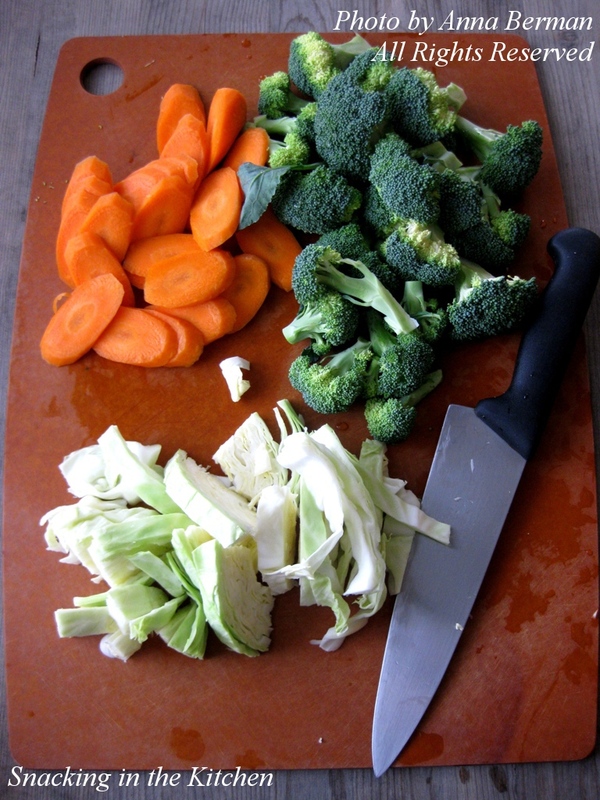 I chopped up carrots, broccoli and cabbage and quickly blanched the vegetables in boiling salted water. Once the vegetables were drained, I used the water to cook rice noodles. 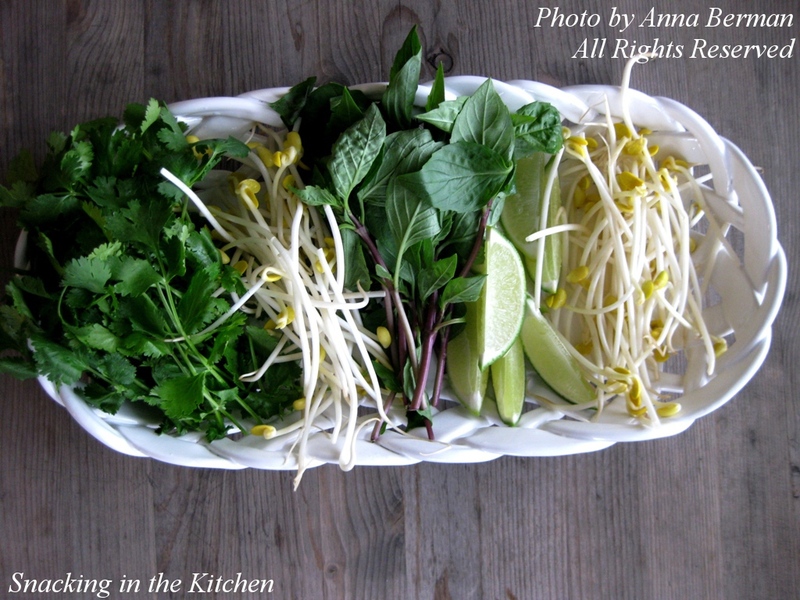 While the broth was simmering and the noodles were cooking, I prepared the condiments for pho: soy sprouts (they are heartier and sturdier than regular bean sprouts), cilantro, Thai basil, and extra lime wedges. I used a small plate as a painter’s palate and colored it with chili paste, Sriracha, and hoisin sauce. We were ready to eat! 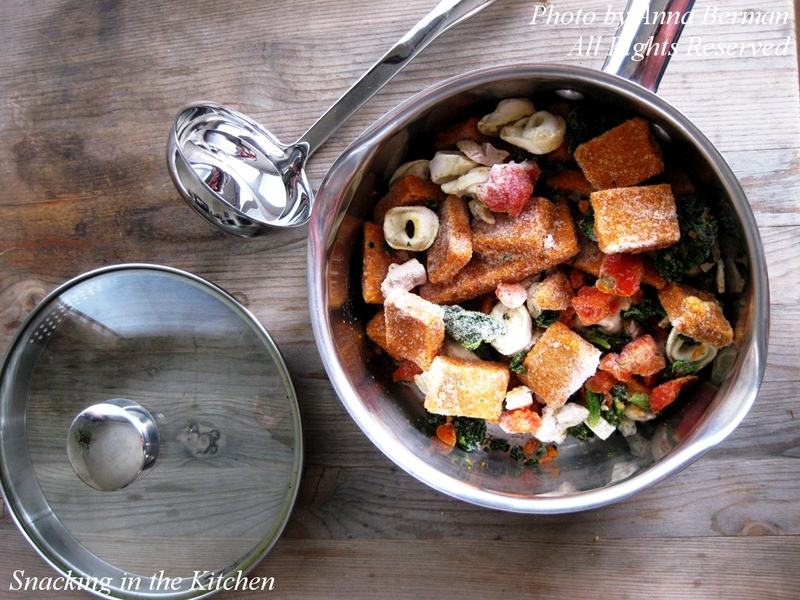 Place vegetables on the bottom of a large bowl. Top with rice noodles and ladle hot broth to cover. What’s next is up to you! Garnish with condiments, give it a stir and slurp away. Want more pho? Check out these posts from the past: Pho on the Floor, Do re me Pho so la te do, and Pho in Birmingham. 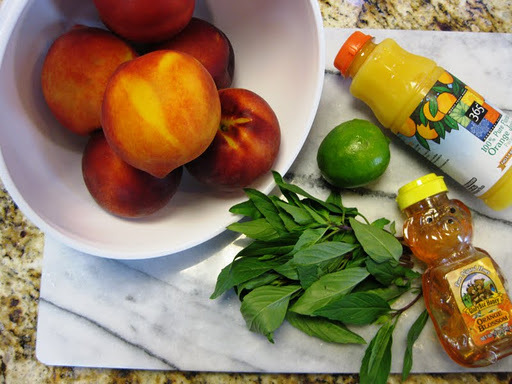 Be sure to take advantages of the sweet, juice dripping peaches! Eat them as is, or puree them for a refreshing soup. I don’t mind the skin, and love how it adds specks of dark rich color to the soup. If you’d rather leave the skin out, peel it with a serrated peeler. 1. 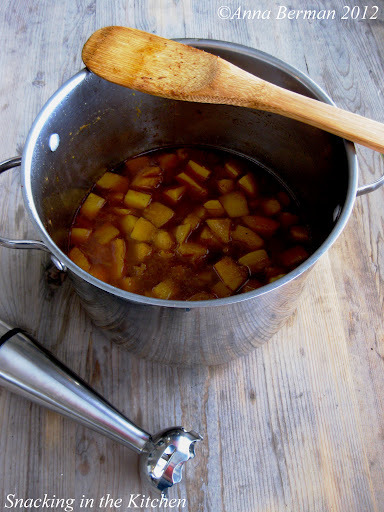 Place peaches, water, juice, honey, lime zest and lime juice inside the blender. Puree until smooth. Transfer to a bowl, cover with plastic wrap and refrigerate until well chilled, about 2 hours. 2. 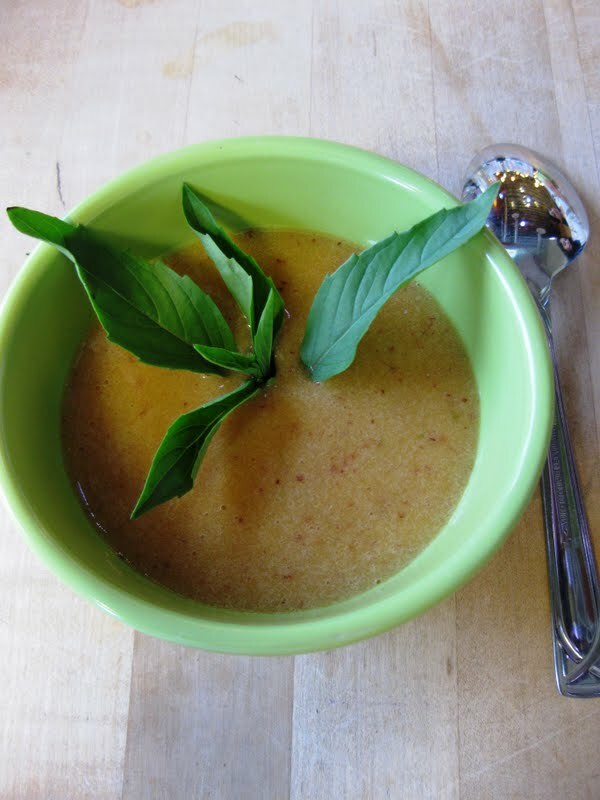 Pour soup into bowls or cups, garnish with basil and serve. 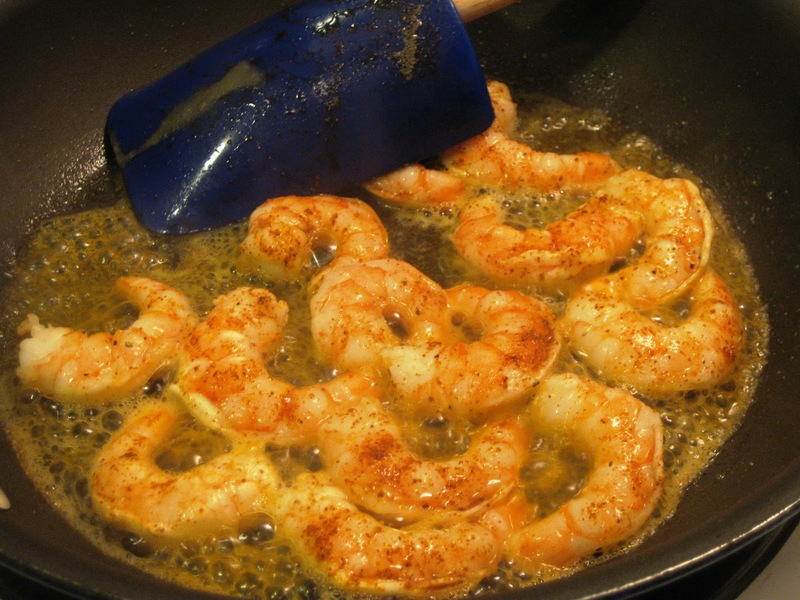 If you are looking for a more savory application, I like to add a pinch of salt, black pepper and cayenne. 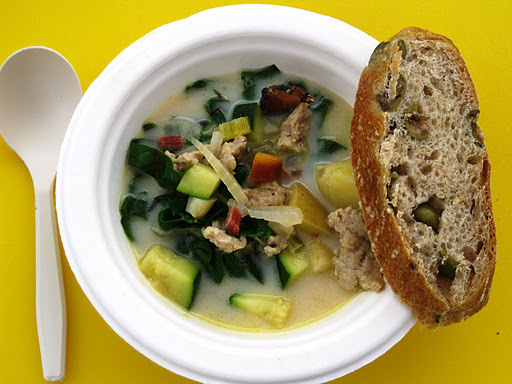 Be sure to check back to find out what I did with soup leftovers. 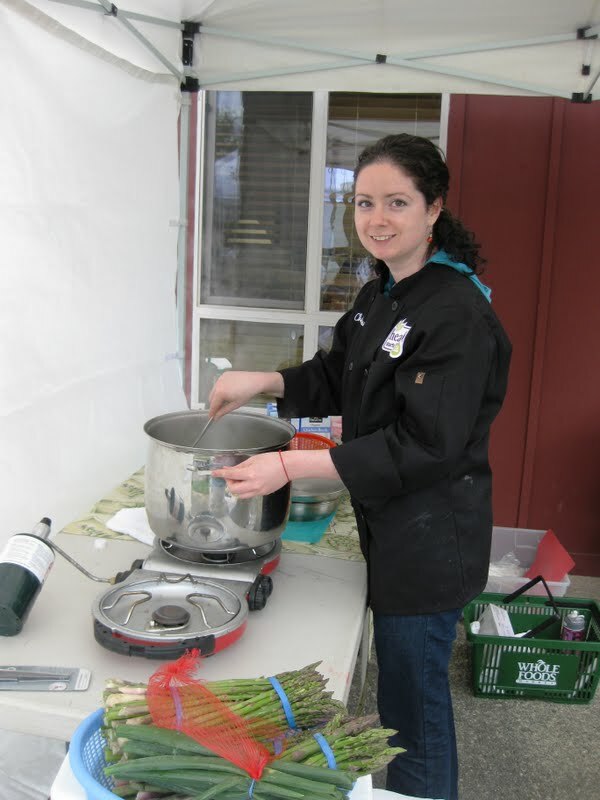 I’ve had so much fun cooking at the Carnation Farmers Market that I decided to come back for the 3rd time. My two previous visits to the Stone Soup Kitchen resulted in Cream of Asparagus Soup and Summer Smoked Salmon Chowder. 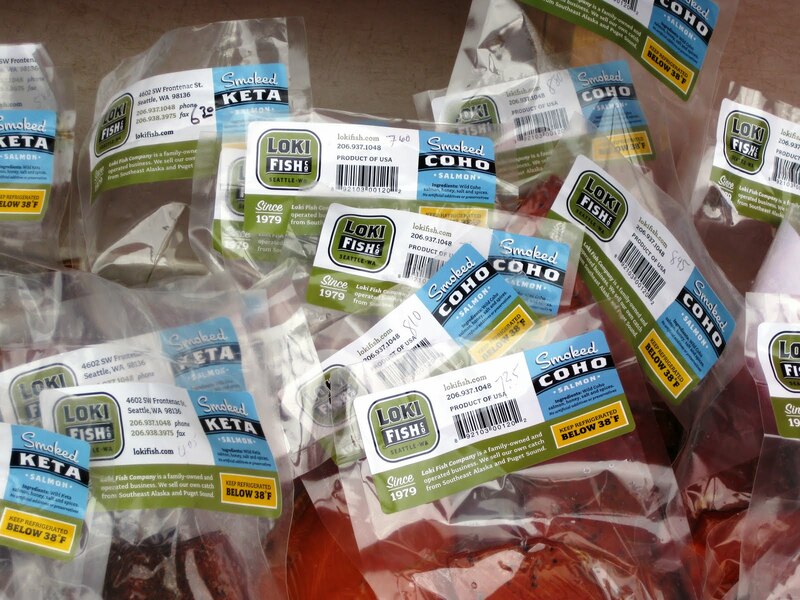 (Have you tried the recipes yet? If not, what are you waiting for?) What would I make this time around? You might remember that last time I could not find new potatoes at the market. So when I heard that these little young spuds made their appearance, I decided to definitely use them! So young, so innocent, creamy and tender, these potatoes didn’t even need to be peeled. But the soup shall not be build on potatoes alone. 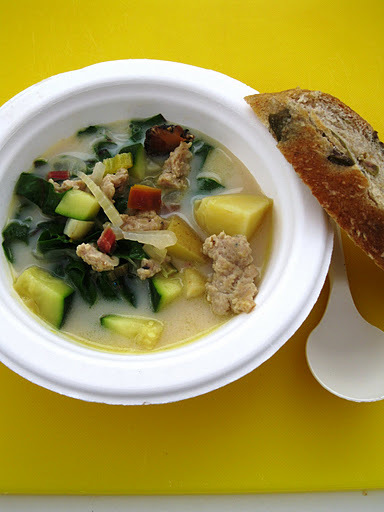 I took my inspiration from a Tuscan Sausage and Kale soup I have once cooked with my friend Melissa. 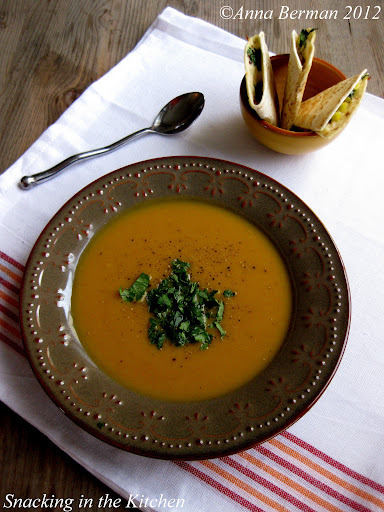 That soup was a perfect bowl of comfort on a cold October night, and even though, some of these summer days might have felt like October to you, I wanted to bring the soup into the summertime. I made a few changes to lighten up this soup. 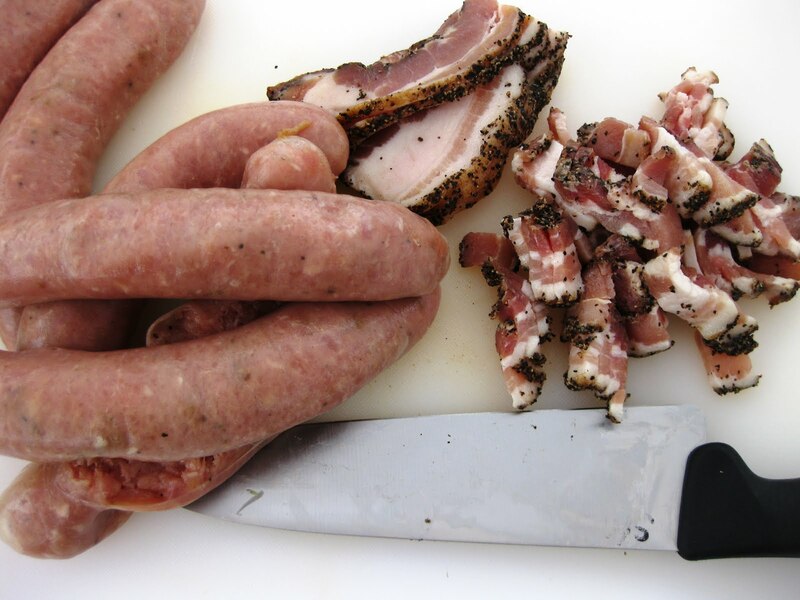 Instead of using pork sausage, I used Spicy Italian Chicken sausage, but kept the peppered smoked bacon, both from Whole Foods Market. 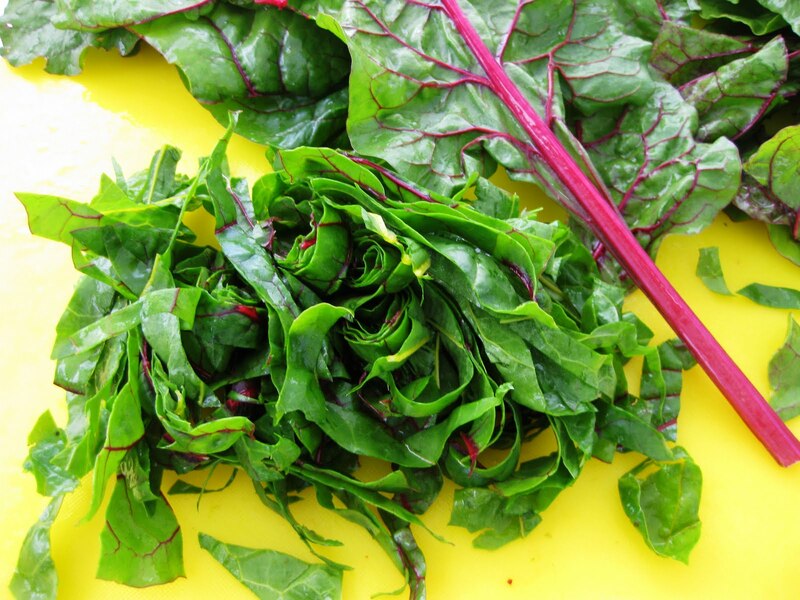 Also, I replaced the traditional kale with bright and colorful Red and Rainbow Swiss Chard. 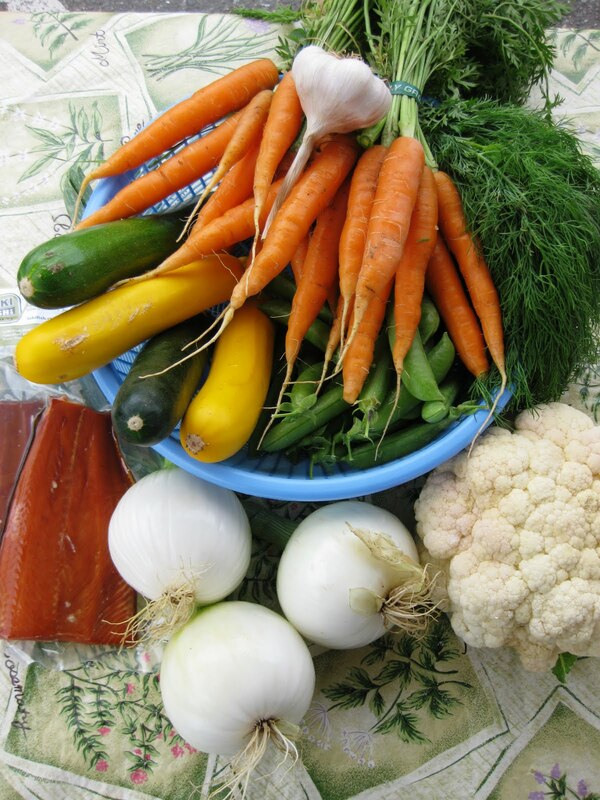 And finally, I added more summer vegetables – rainbow carrots and green zucchini. Let’s get cooking! 1. Heat oil in a large saute pan. Add bacon and saute for 5 minutes. Add sausage and cook until sausage is no longer pink inside, about 5-8 minutes. Be sure to break sausage into small pieces while it’s cooking. 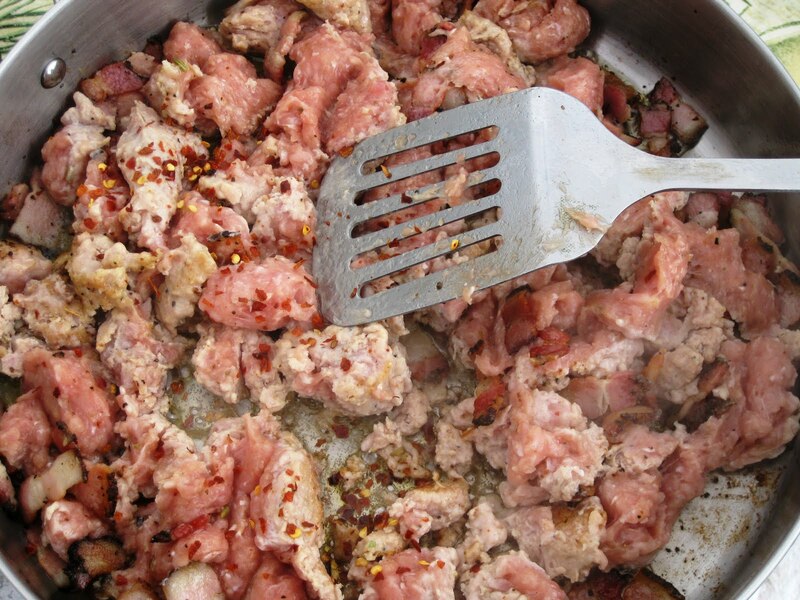 Removed bacon and sausage from a pan (reserving the fat) and set aside. 2. 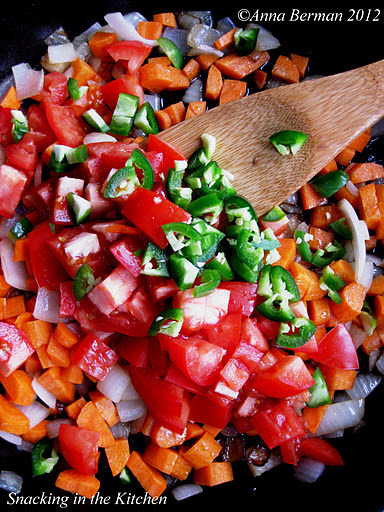 Add onion, fennel and red pepper flakes to the pan and cook until vegetables are translucent, 8-10 minutes. Remove from heat. 3. 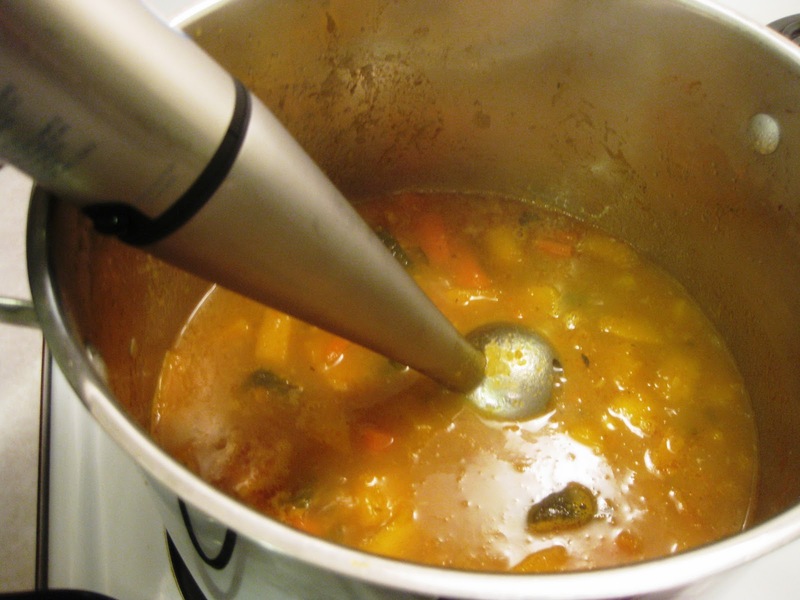 In a large soup pot, combine chicken broth, potatoes, and carrots. Season with salt and bring to a boil. Partially cover the soup pot and lower the heat to simmer. Cook until potatoes and carrots are tender. 4. 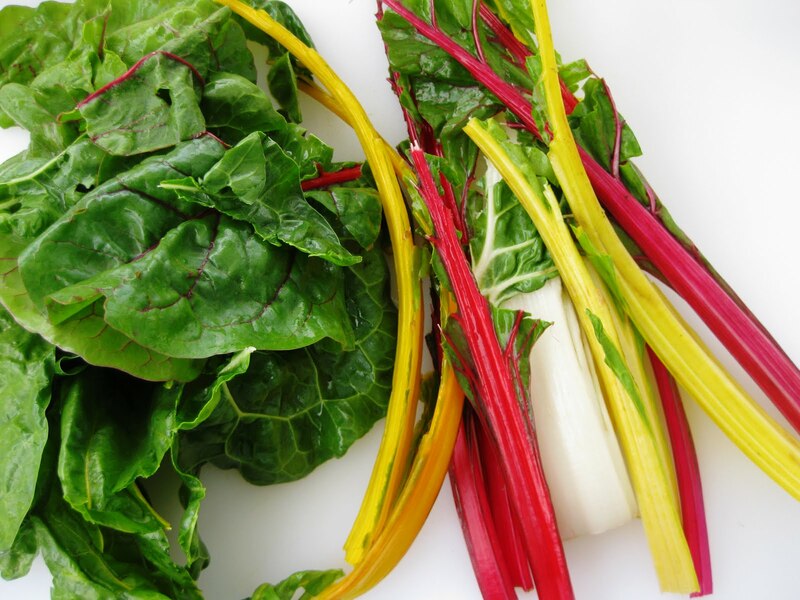 Add the stems of Swiss chard and zucchini and cook for another 3-5 minutes. 5. Add milk and bring to a simmer. Be sure not to boil, or the milk will curdle. 6. 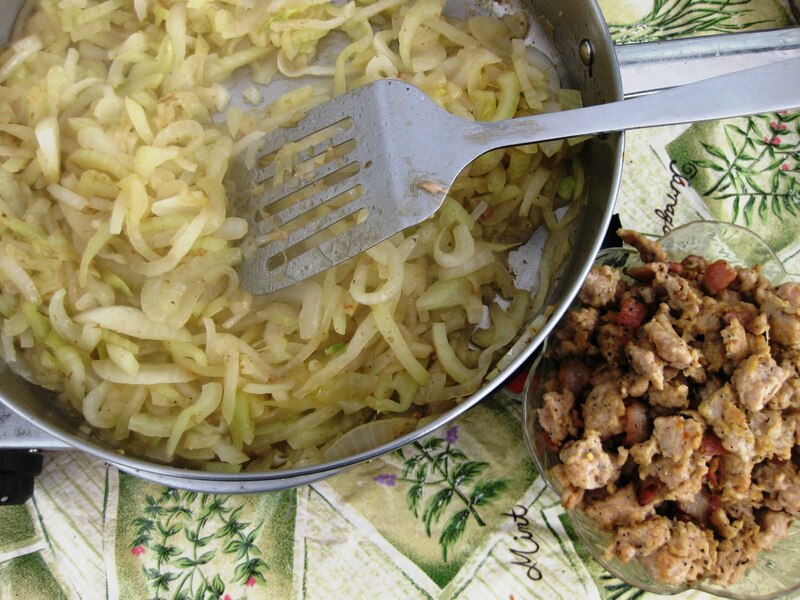 Add Swiss chard leaves, cooked bacon and sausage, and onions with fennel. Cook until Swiss chard is slightly wilted and everything is heated through. Taste and season with salt and pepper. 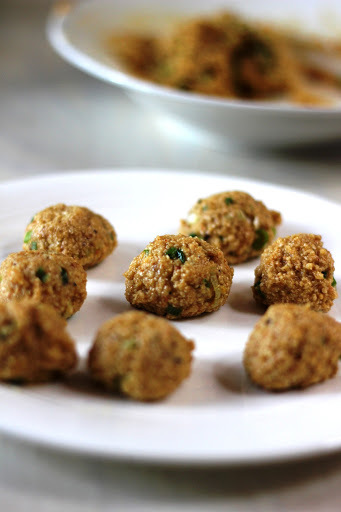 Serve with green olive bread from Preston Hill Bakery and butter from Golden Glen Creamery. 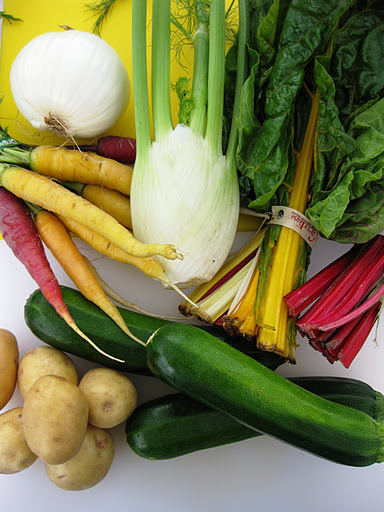 Thank you SO much to all the farms for providing beautiful vegetables. 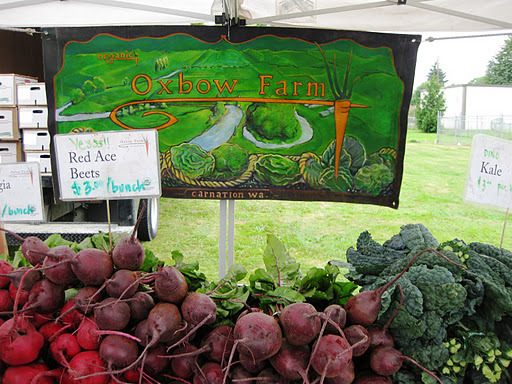 Oxbow Farm for the gorgeous rainbow carrots. 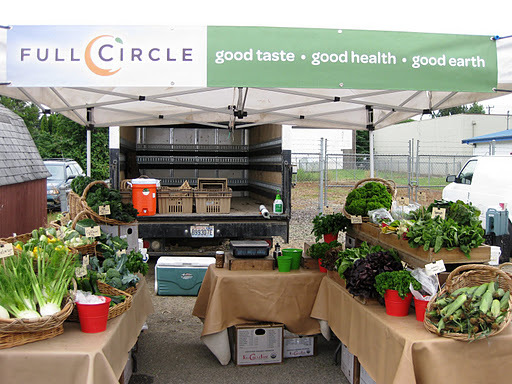 Full Circle Farm for fennel, rainbow and red Swiss chard. Bautista Farm for onions and potatoes. Thanks to everyone who came for a taste, cup, and bowl of soup and made this Stone Soup Kitchen another success! 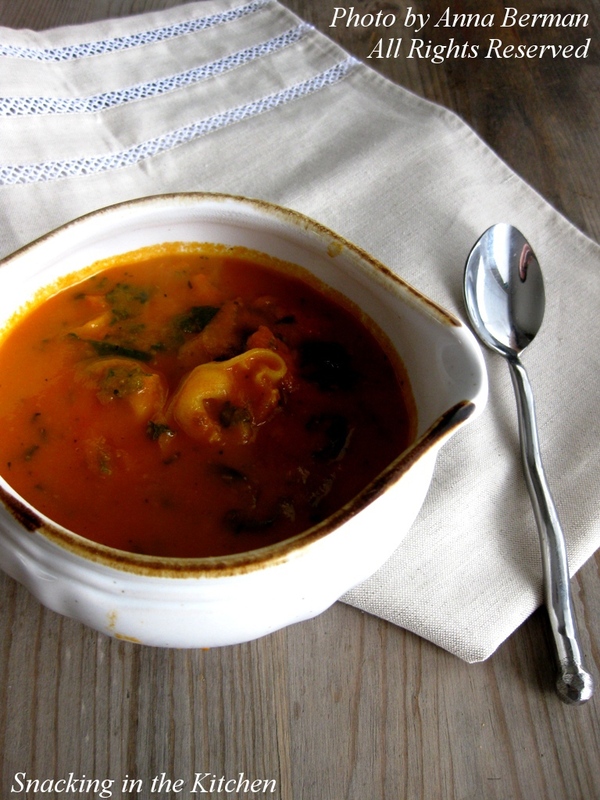 What’s your favorite summertime soup? 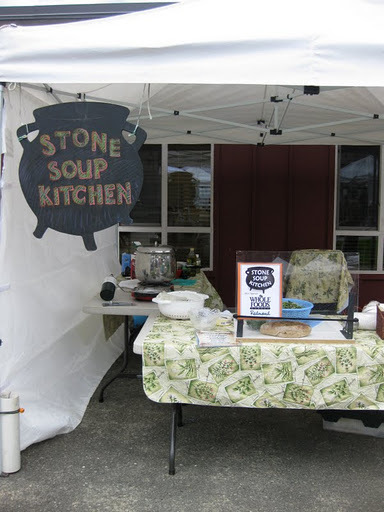 I am back at the Carnation Farmers Market following my last successful apperance there a month ago, as a guest chef for Stone Soup Kitchen. 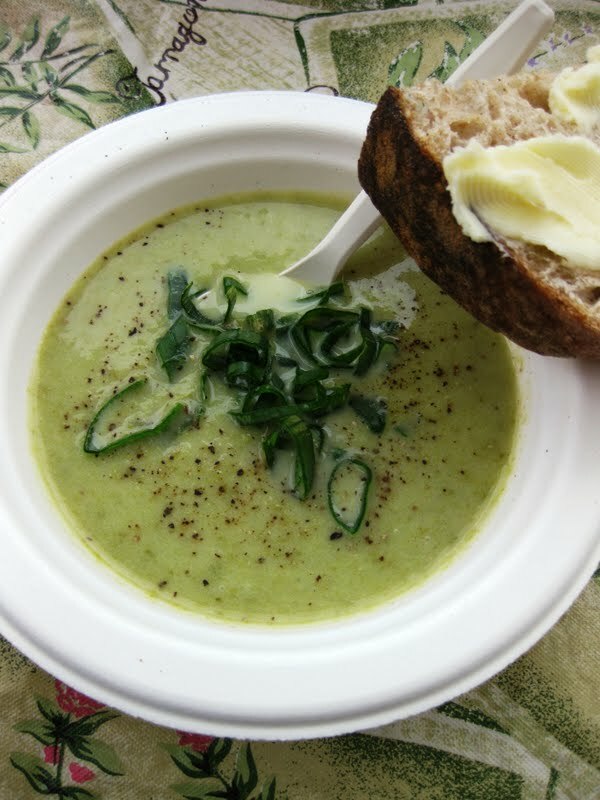 Last time at the peak of asparagus season, I made Cream of Asparagus Soup. This time the produce dictated something different. 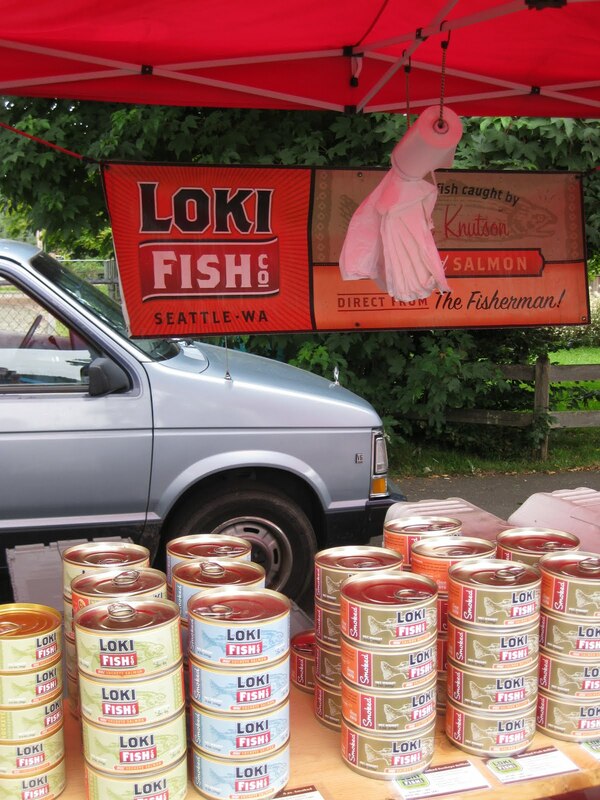 The market had a salmon vendor – Loki Fish Co! Focusing on smoked salmon as my main ingredient, i whipped up a gallon of Smoked Salmon Summer Chowder. It’s quite different shopping at the market than going to your grocery store. I was counting on using potatoes as a thickener in the chowder. Alas, as I arrived at the market, I found out that it was too early in the season for potatoes. Instead, I decided to use a head of cauliflower. Celery was also unavailable. 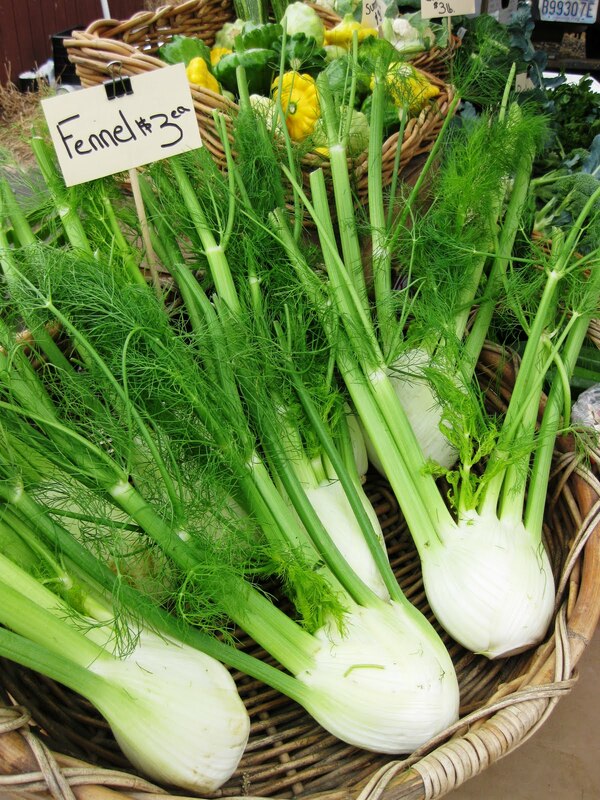 I spotted fresh bulbs of fennel too late, otherwise, fennel would have been great in this chowder. Thank you to the farmers! 1. Heat olive oil in a large soup pot over medium high heat. Add onions and garlic and saute for 7-10 minutes until transluscent. Add carrots and continue to cook 5 more minutes. 2. Add vegetable broth and bring to a boil. Lower the heat, cover the soup pot with a lid and simmer for 10 minutes. 3. Add cauliflower stems and sliced sugar snap pea shells. Continue to cook the soup. 4. 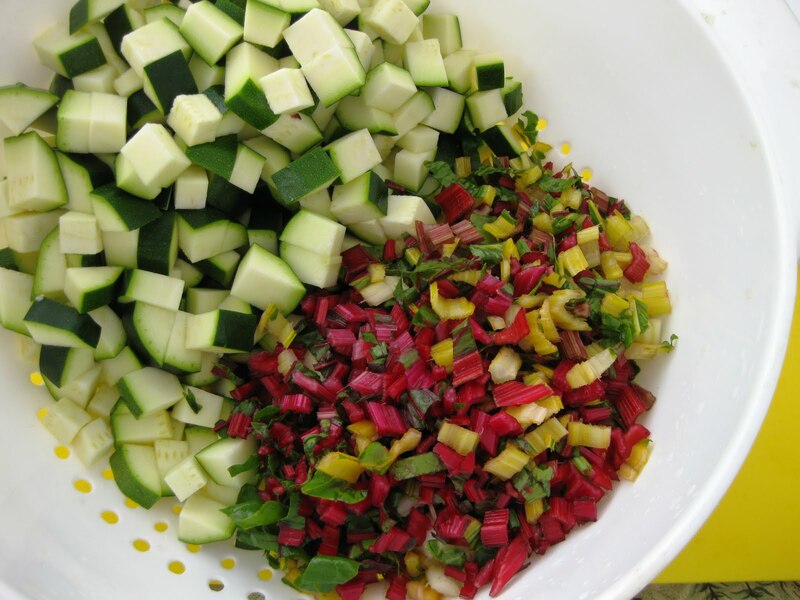 Once the vegetables are almost to your desired doneness, add cauliflower florets, squash and zucchini. 5. 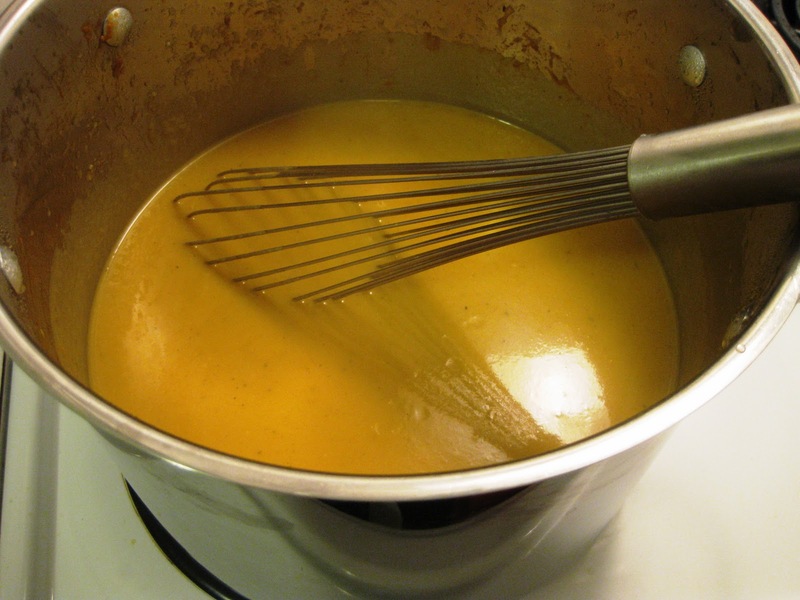 Whisk in half and half – be careful not to boil the soup once half and half has been added or it will curdle. 6. Gently add the salmon and season the soup with salt. Serve with fresh dill. 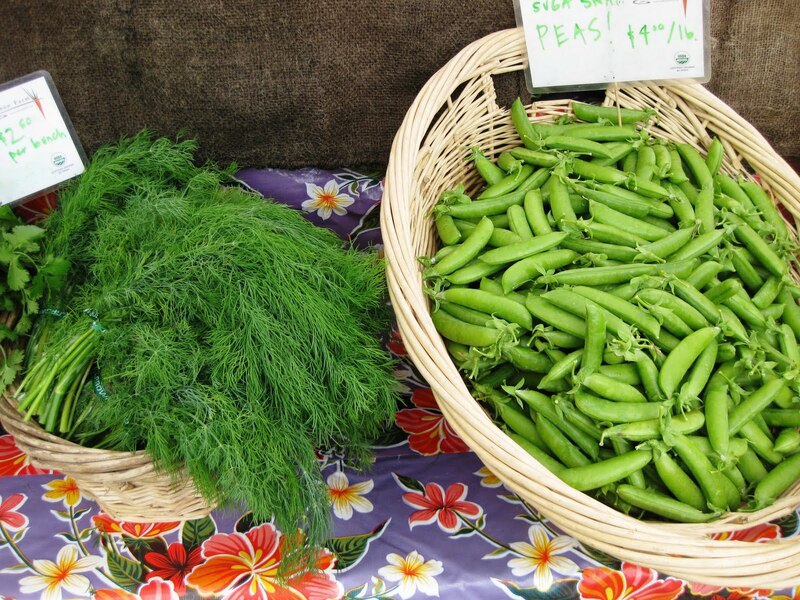 The farmers markets are literally sprouting everywhere these days. 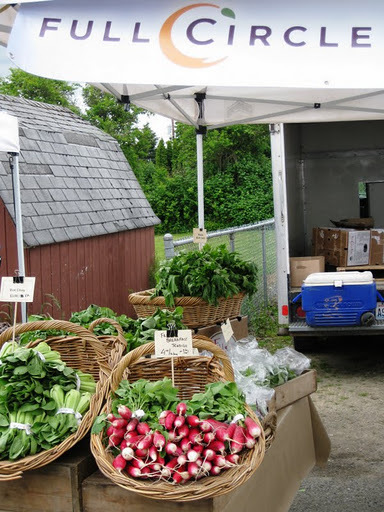 Seasonal and local produce from the farm to your table in matter of minutes – what could be better? 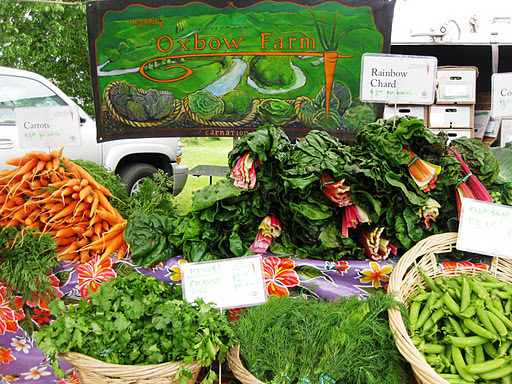 You meet the farmers, pick up delicious produce, and enjoy the sun, if you are lucky. The other day, I went to Carnation Farmers Market to represent Whole Foods Market and take part of the Chef Series at Stone Soup Kitchen. 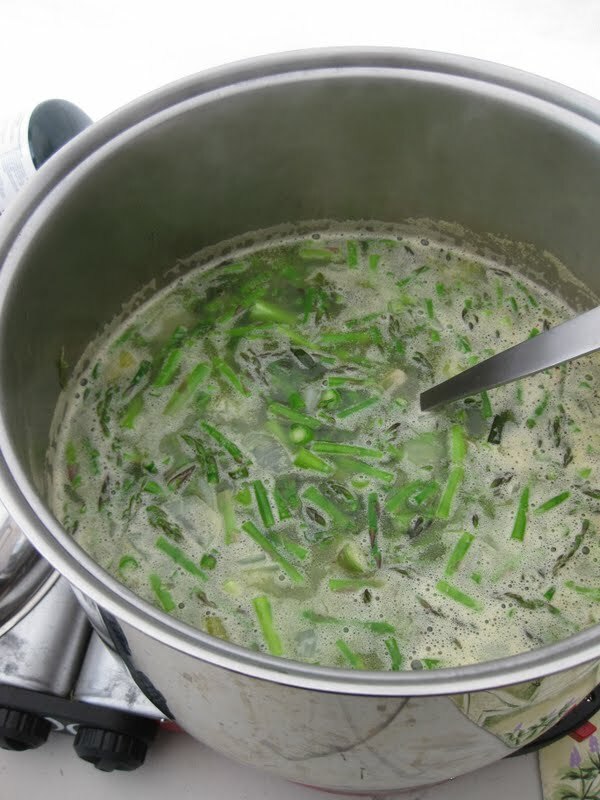 It was still early in the season and asparagus was abundant, making the choice of which soup to make quite easy – Cream of Asparagus Soup. 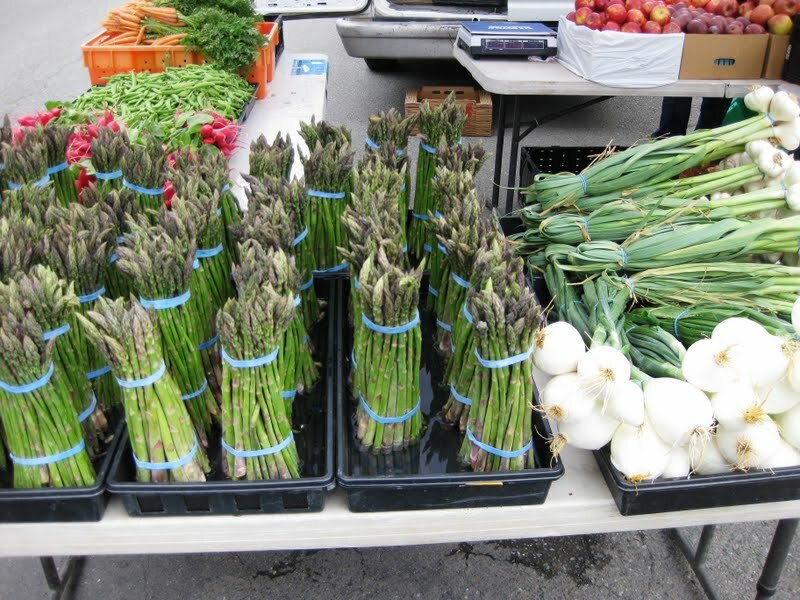 I loved walking from one vendor booth to the next, picking up the necessities for the soup – asparagus, young onions, potatoes and scallions. I also got freshly baked bread and Golden Glen butter. The rest of the staples (stock, olive oil, heavy cream, salt and pepper) came from Whole Foods Market. Let the cooking begin! Stone Soup Kitchen set up: down to the basics. A table, a pot, cutting board, semi-sharp knife, some utensils and a heating mechanism with propane. First things first – I need some asparagus and onions. 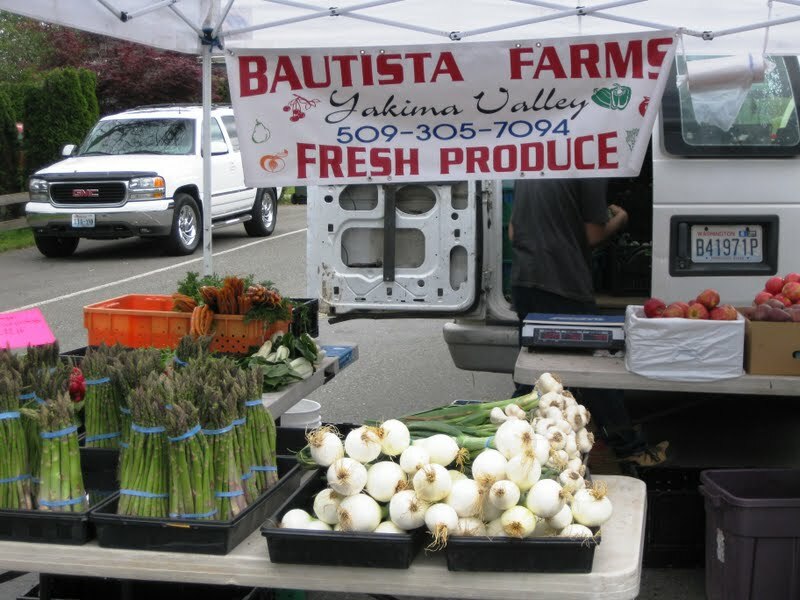 Thanks to Bautista Farms! 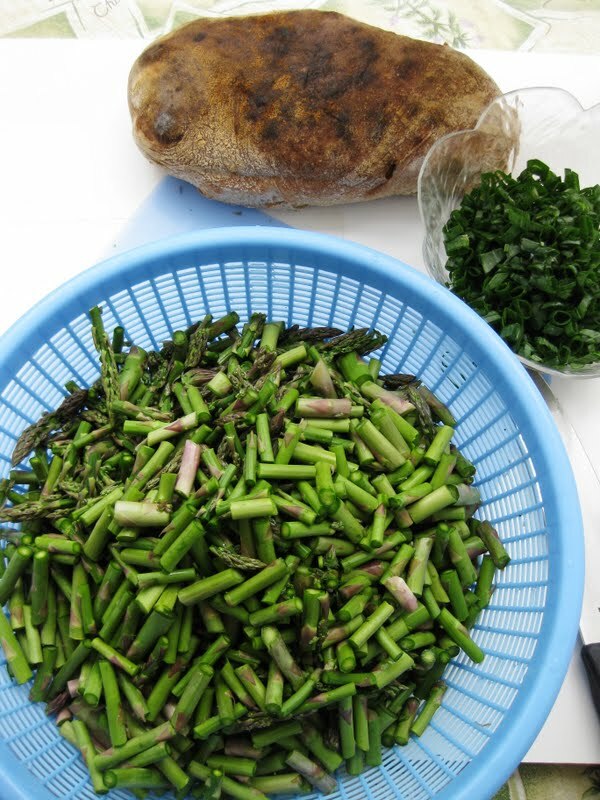 The asparagus was quite gorgeous – straight, slim spears in a bright green color. The young onions were pure and bride-like in their white. They’ll be very sweet and delicious, roasted whole. 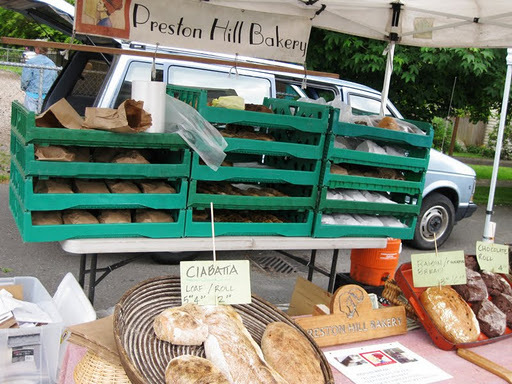 Bread, crusty, slightly sour, from Preston Hill Bakery. 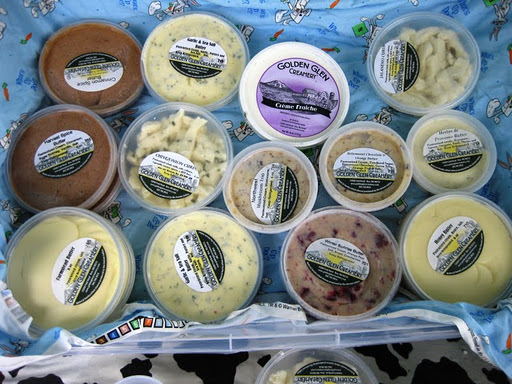 And since every piece of bread needs a bit of butter, I stopped by Golden Glen Creamery. I must admit, I’m not crazy about butter, in general. But theirs was beyond creamy, sweet, and delicious. Cut up asparagus into about 1-inch pieces. Sautee asparagus and onion with some olive oil. Season with salt and pepper, add potatoes and chicken stock and cook until the vegetables were tender. 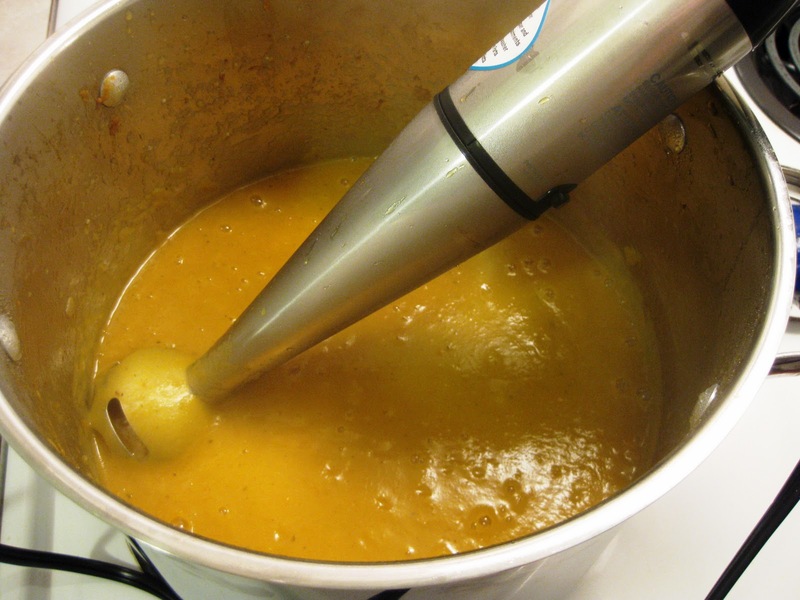 Next, using a stick blender, puree the soup until it is nice and smooth. Add heavy cream and you are in business! Garnish with green onions. Before and after! 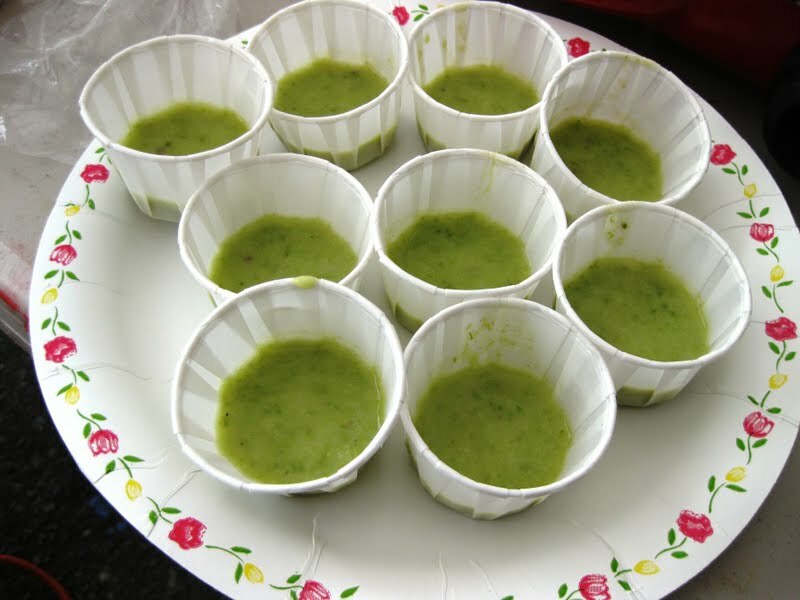 I sampled the soup in small cups and sold larger amounts with bread and butter to the markets’ visitors. All the proceeds went to support the market! 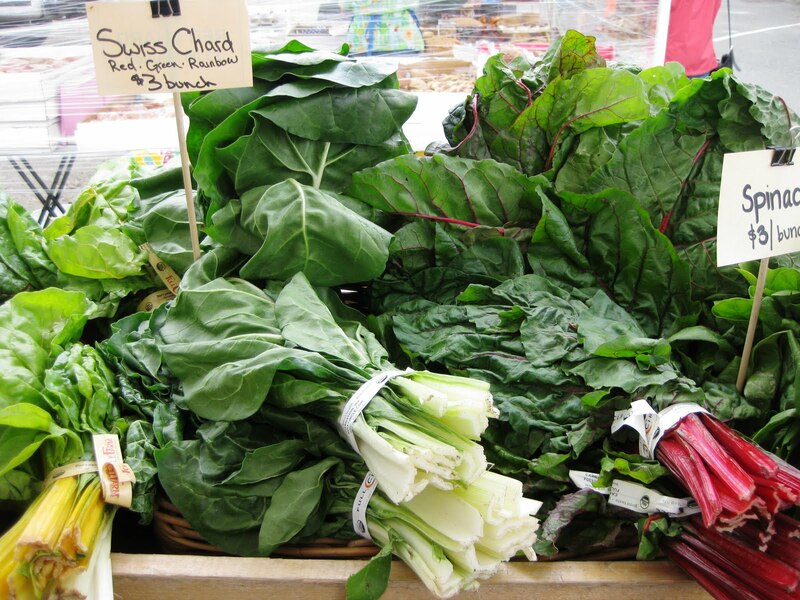 What’s the latest bag of produce you bought at the market? Check back in a few weeks for my next Stone Soup Kitchen adventure. This might as well be called “What’s in your refrigerator?” soup. But most soups are like that, aren’t they? A little bit of this, a little bit of that, and less than an hour later your heart and soul are warmed with a bowl of soup. What’s very exciting about this particular soup is that I finally got to use my immersion Cuisinart hand blender! It’s fantastic. If you don’t have one, get it! Or, you can use a blender, but it’s so much more dangerous, and who wants to have an extra item to wash? 1. In a large soup pot heat olive oil over medium high heat. 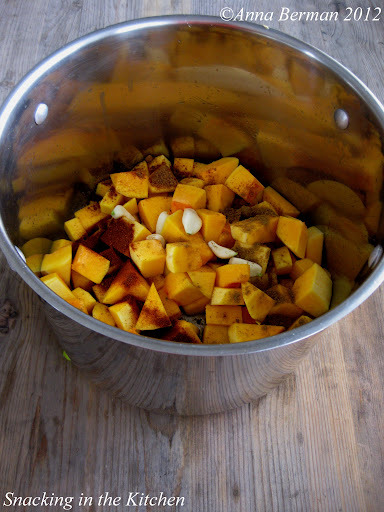 Add squash, potatoes, carrots, onion, pepper, garlic and curry paste. Saute, mixing occasionally for 15 minutes. Season with salt and pepper. 2. Add boiling water or stock to the pot, just enough to cover the vegetables. 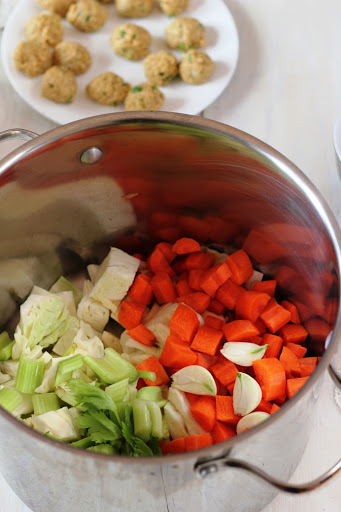 Bring the soup to a boil, lower the heat and simmer for 30 minutes or until the vegetables are completely tender. Note: this is not where you want to keep your vegetables al dente. This is going to be a pureed soup. 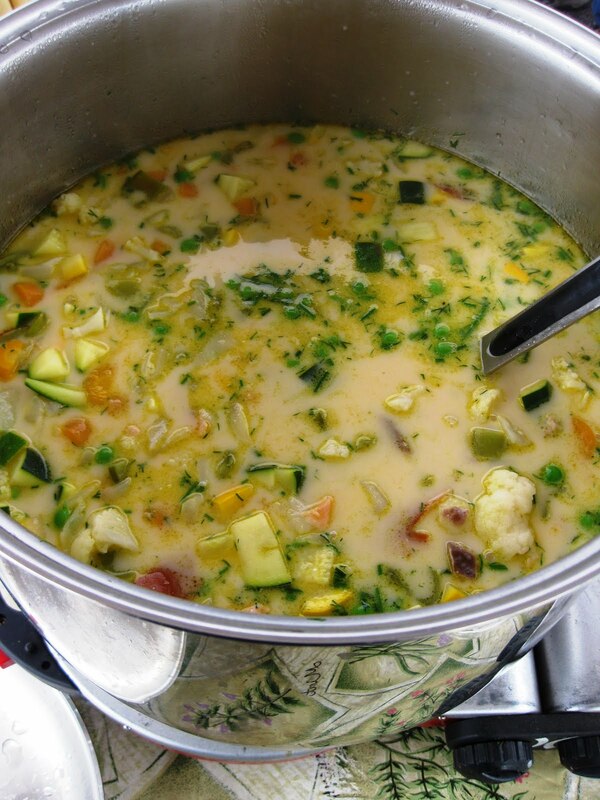 If your vegetables are not completely, thoroughly cooked, you’ll have a very grainy and unappetizing texture to your soup – no silky, velvety deliciousness for you! 3. Turn off the heat. 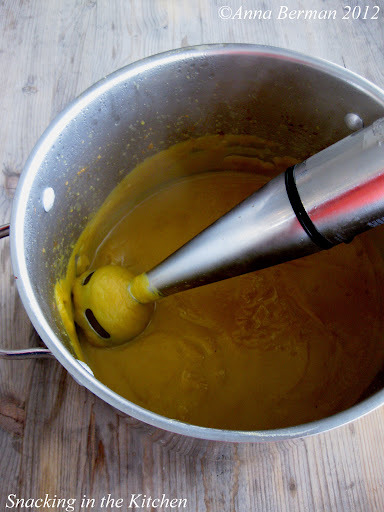 Take your immersion blender and puree the soup. Be careful not to lift up the blender while you’re using it – if you do, you’ll be sorry. Have you ever been splattered with hot soup? I hope not! 4. 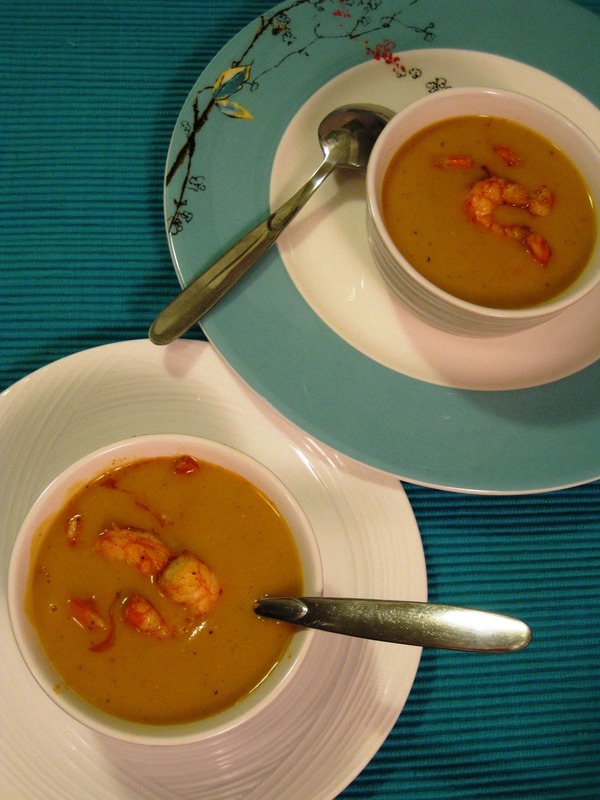 Once the soup is completely pureed, whisk in a can of coconut milk. If needed, gently reheat the soup, just don’t bring it up to a boil again. Taste the soup! Adjust for salt and pepper and get your soup bowl ready! 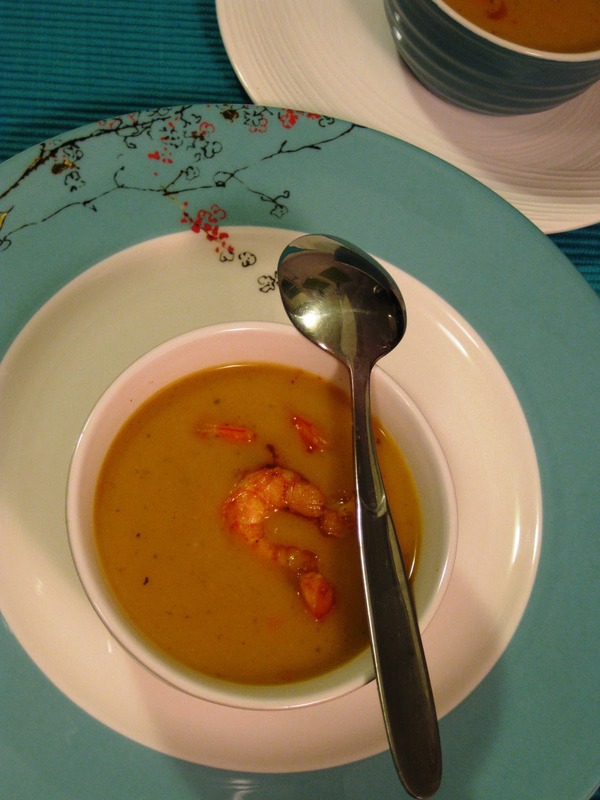 I topped the soup with spicy sauteed shrimp.